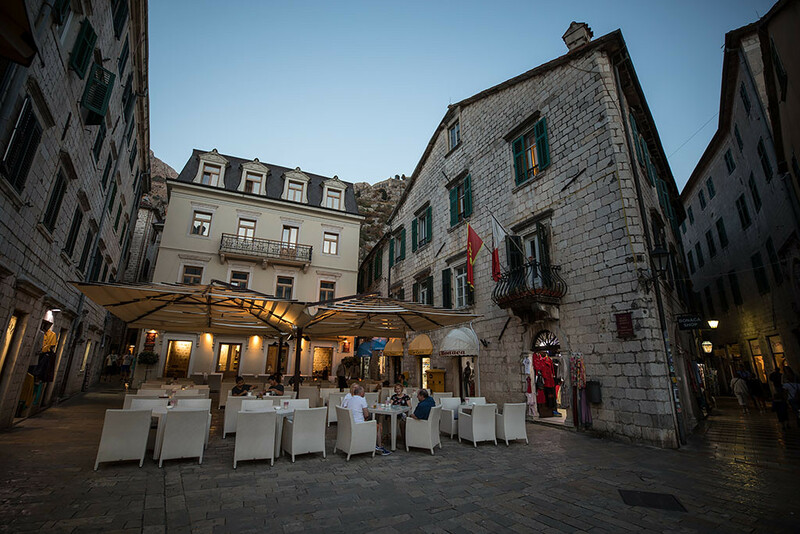 My trip from Sarajevo to Dubrovnik, getting a dose of 80's chic at the famous Holiday Inn Hotel in Sarajevo, watching a diver jump into the Neretva River from Stari Most in Mostar, taking in the amazing view of Kotor Old Town and the deep blue waters of Kotor Bay from above, experiencing an amazing day of wine tasting along the Pelješac Peninsula and enjoying a walk through the Old City of Dubrovnik with a Game Of Thrones Princess. 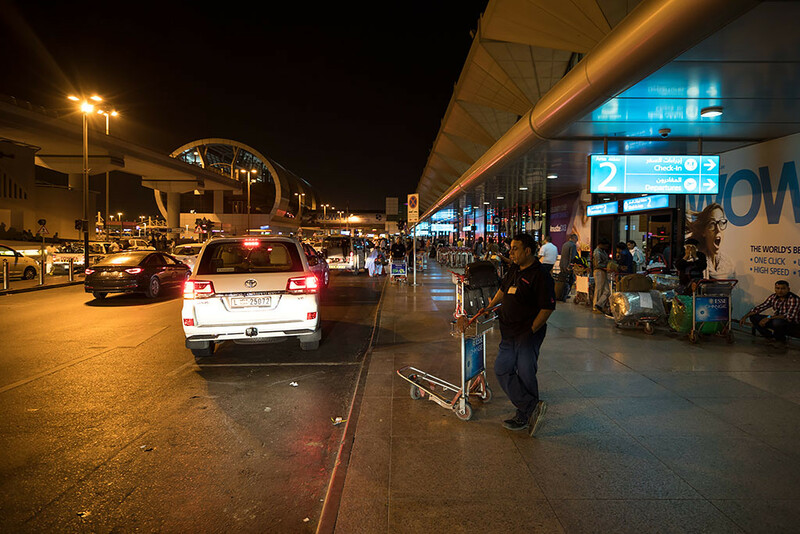 Outside Terminal at Dubai International Airport at 11:30pm, ready to begin my trip. 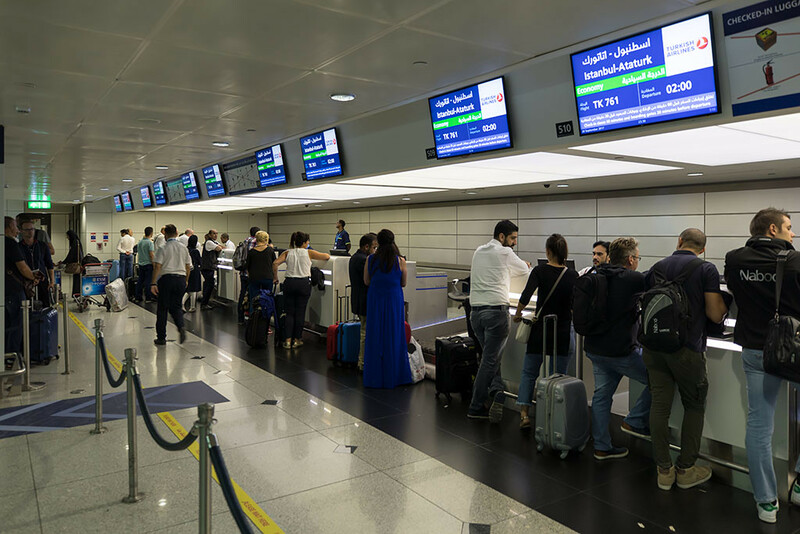 Queueing up to check in for my flight on Turkish Airlines. 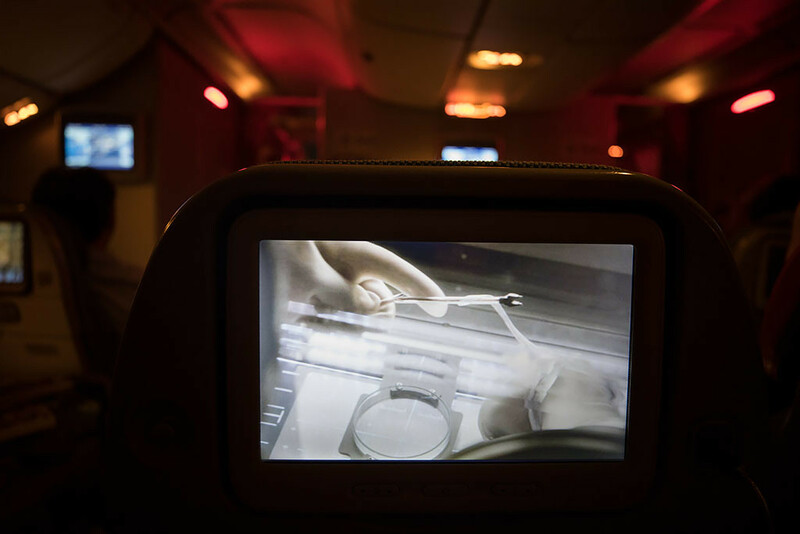 It was my first time flying them since travelling to Copenhagen in 2015. 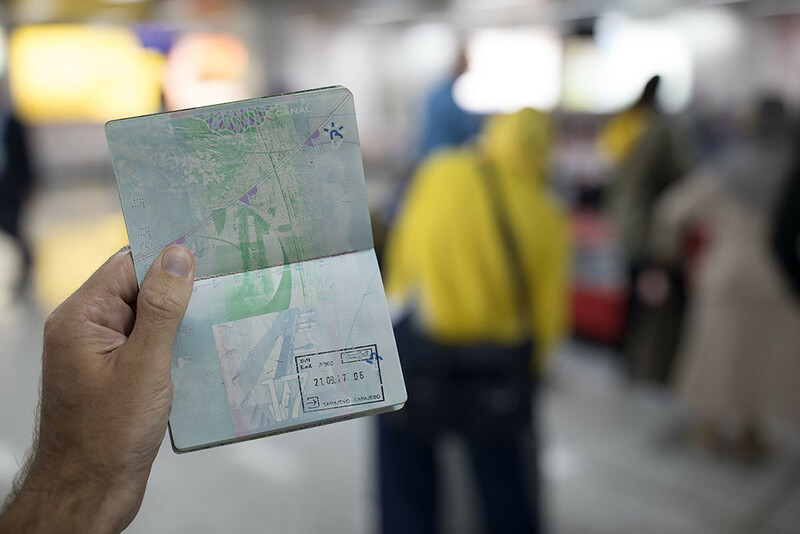 My original plans for the Eid Al Adha long weekend was to head to North Korea to attend the Wonsan Air Show. Four weeks before however it was unfortunately cancelled by the North Korean Preparatory Committee due to “current geopolitical circumstances". 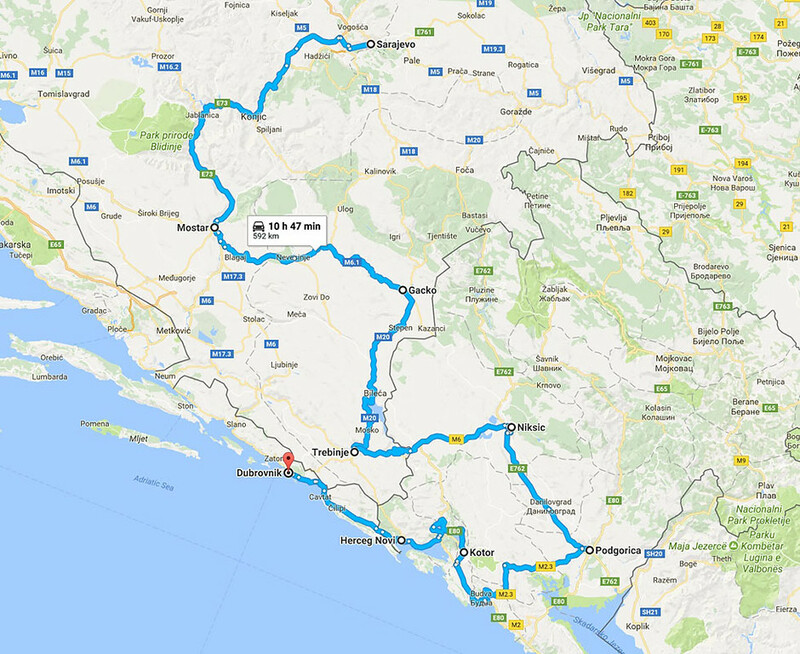 I had researched and made rough plans for a trip to the Balkans previously, so with the air show cancellation I quickly fine-tuned my old plans for a 6 day trip starting in Sarajevo, Bosnia and Herzegovina and finishing in Dubrovnik, Croatia. 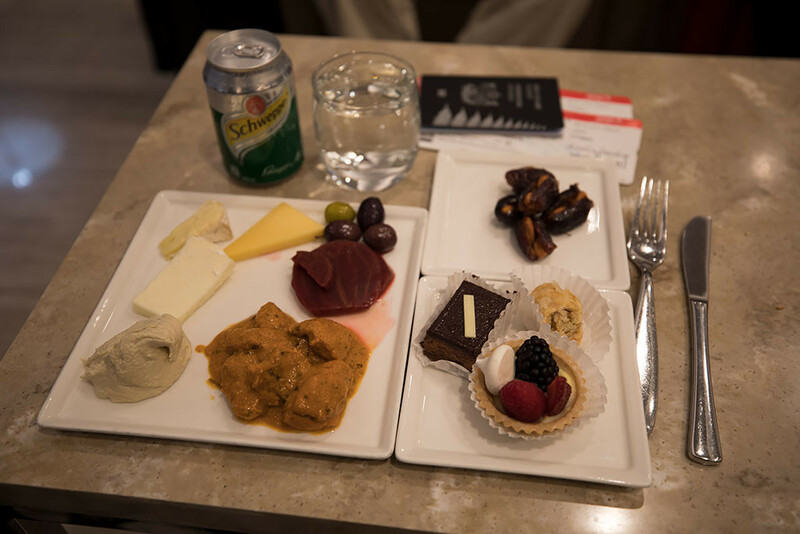 Grabbing some dinner at the Marhaba lounge. 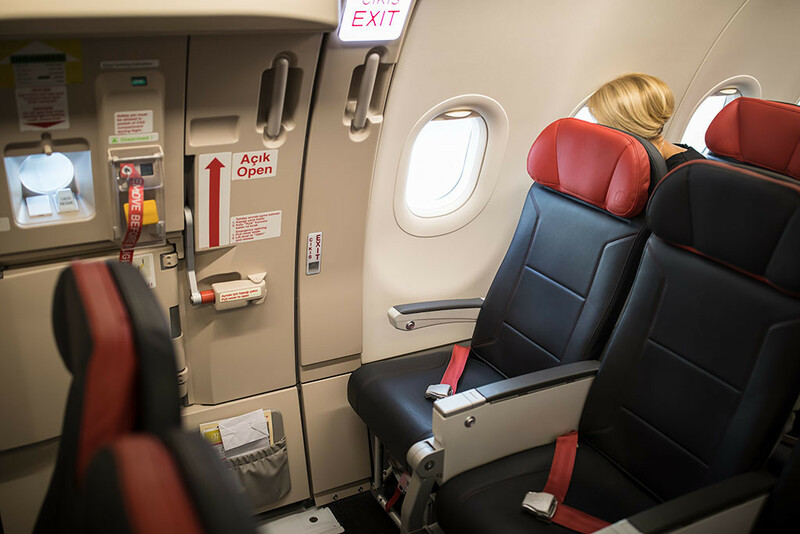 For my flight to Sarajevo I transited via Istanbul's Atatürk Airport (IST) and then returning via Dubrovnik Airport (DBV). Heading down the jet bridge for boarding. 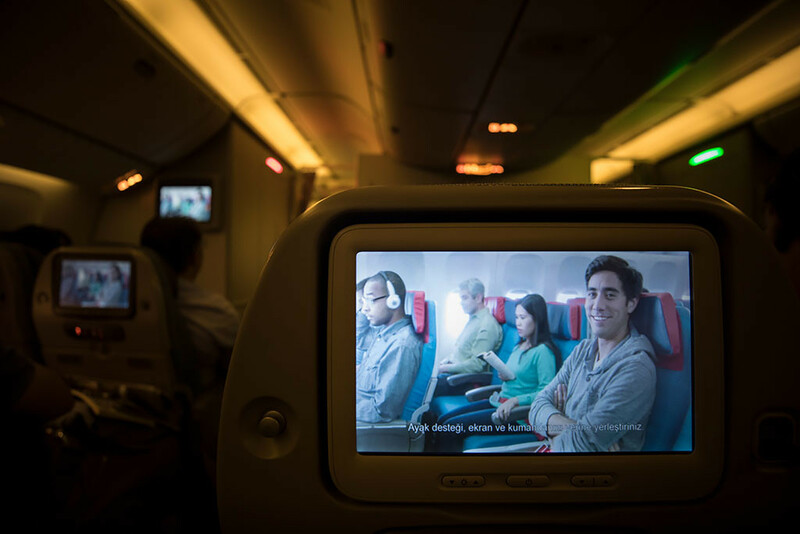 Watching the whimsical safety video featuring Zach King, an American YouTube personality. 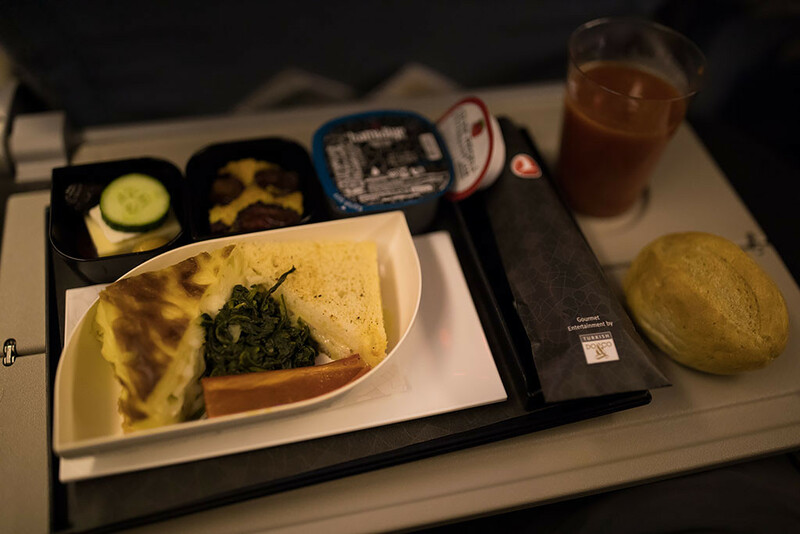 Light meal served soon after take-off. And watching the film, Life, an outer space B-grade science fiction horror. 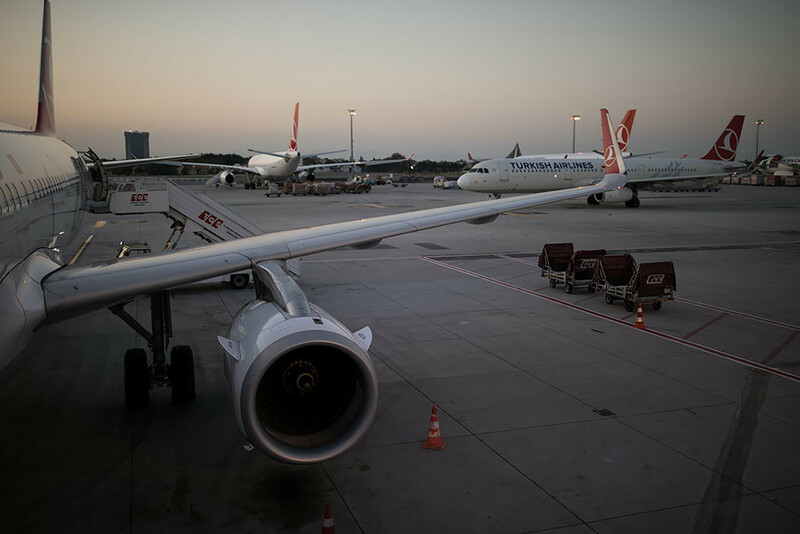 Approaching Istanbul's Atatürk Airport in the early morning. 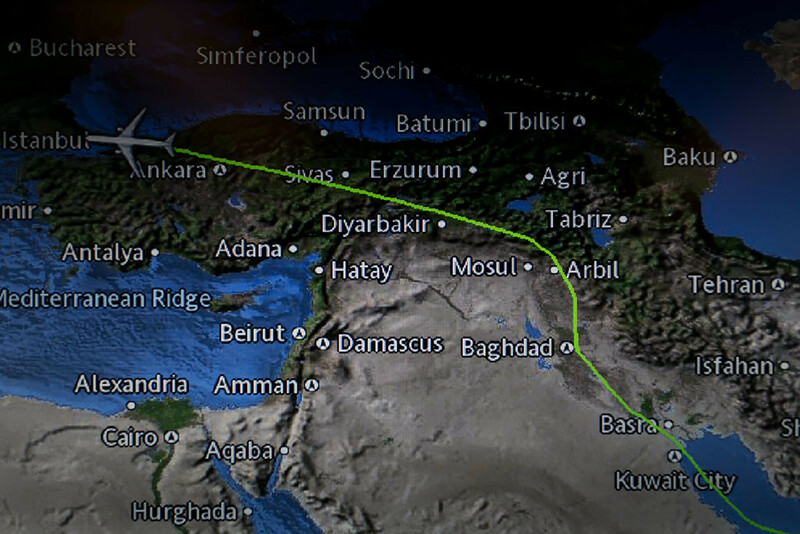 It was interesting to see a route taken through Iraq, with most other airlines opting to go through Iran instead. 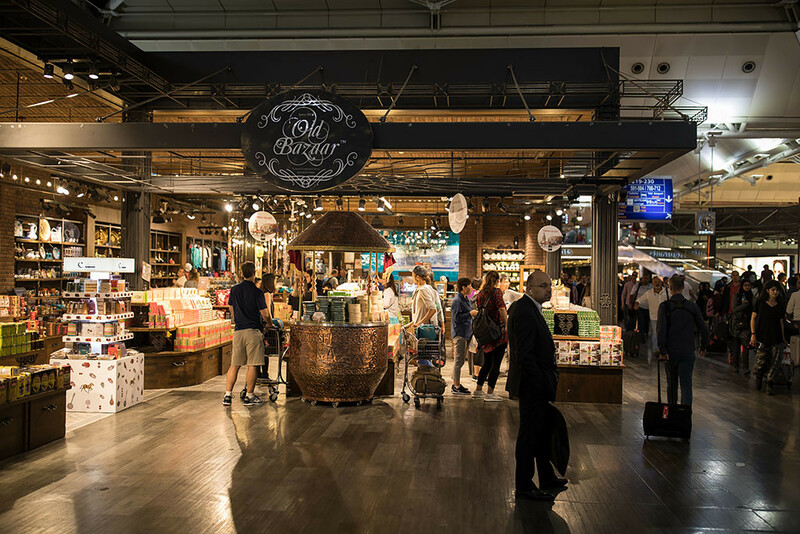 Some of the Turkish delight / lokum on display in duty free as I head to my connecting flight to Sarajevo. 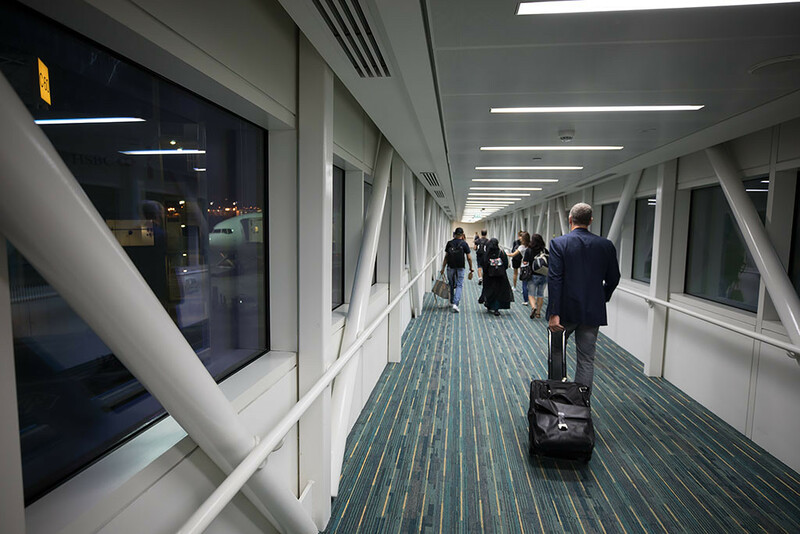 Climbing the stairs to the TK A321 after being bussed to the remote gate. I had a window exit row seat with plenty of legroom. 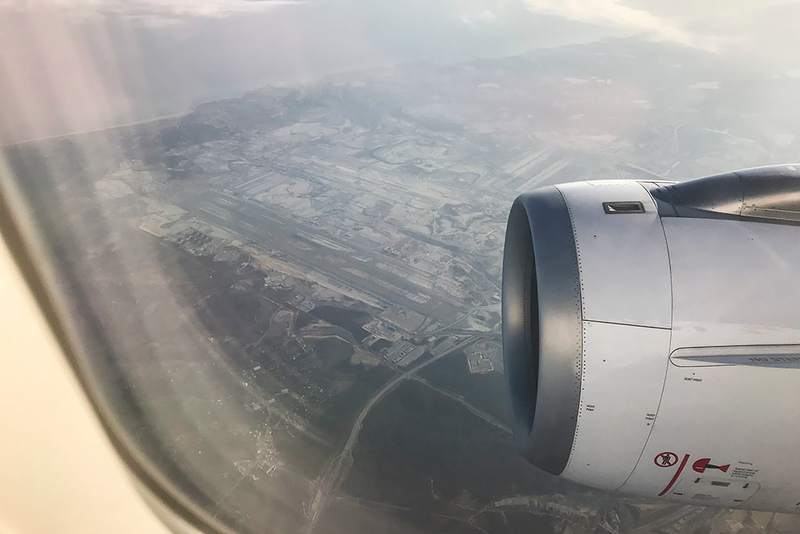 Looking down at the construction site of Istanbul New Airport soon after take-off. Supposedly it is to open sometime in 2018 but this looked a tad ambitious given the view out the window. 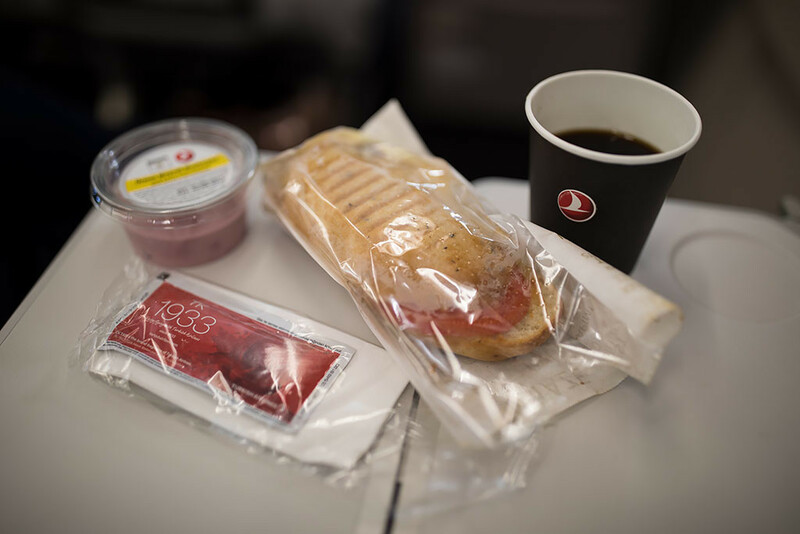 Snack of cheese sandwich, yoghurt and coffee served on the 2 hour flight. 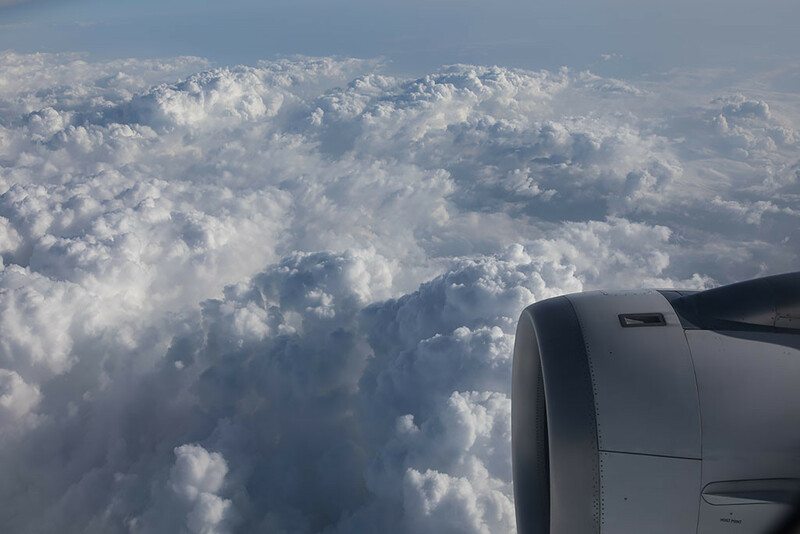 Fluffy white clouds below as we make our way west. 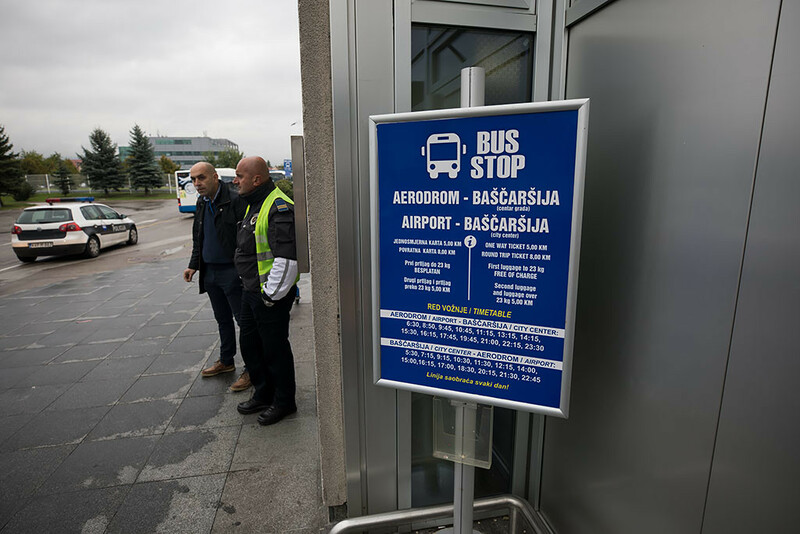 Sarajevo International Airport (SJJ) was relatively small and we were the only flight disembarking on arrival. 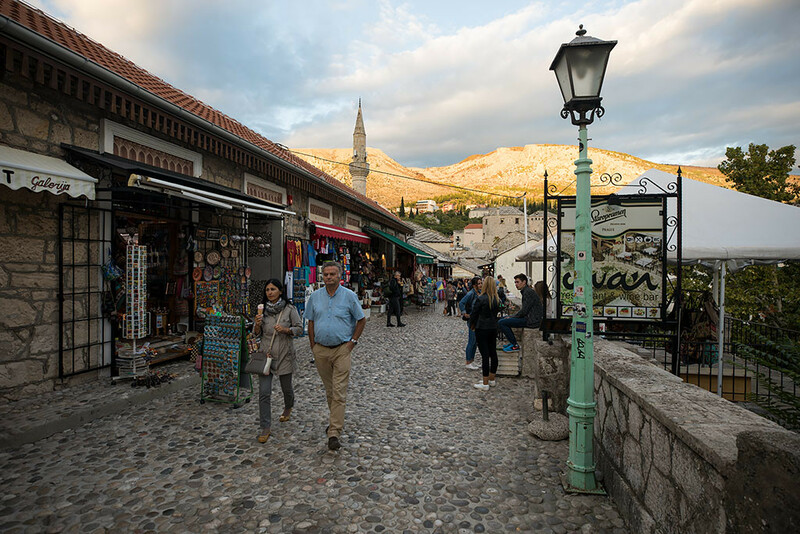 I was then quickly stamped into Bosnia and Herzegovina, my 110th UN country visited. Queueing up for the short 6 kilometre bus ride into town. And outside the famous Hotel Holiday. 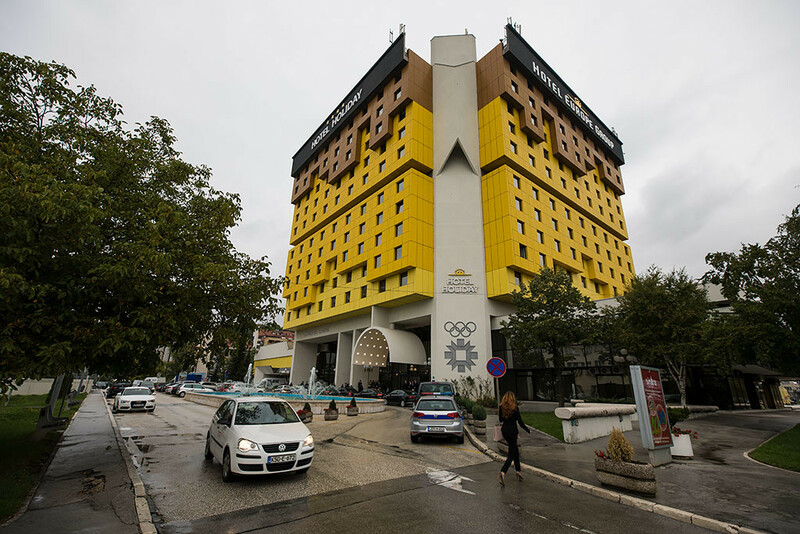 Originally a Holiday Inn, it was built with a modernist take on an old Ottoman-style Sarajevan house in time for the 1984 Winter Olympics. 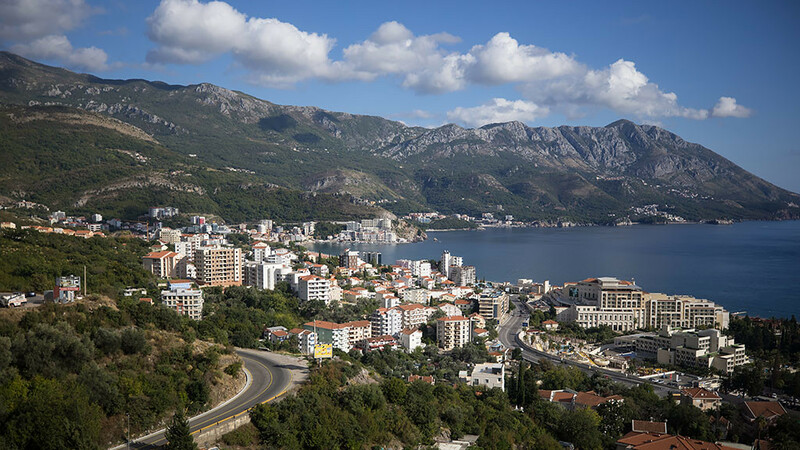 The hotel became a landmark for another reason though when it was on the frontline during the Bosnian War. 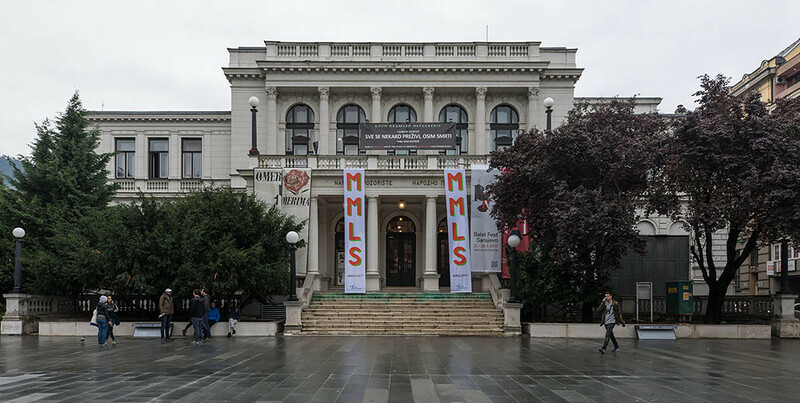 In 1991 at the start of the conflict, snipers were stationed in the hotel, firing shots at protesters outside the nearby parliament. 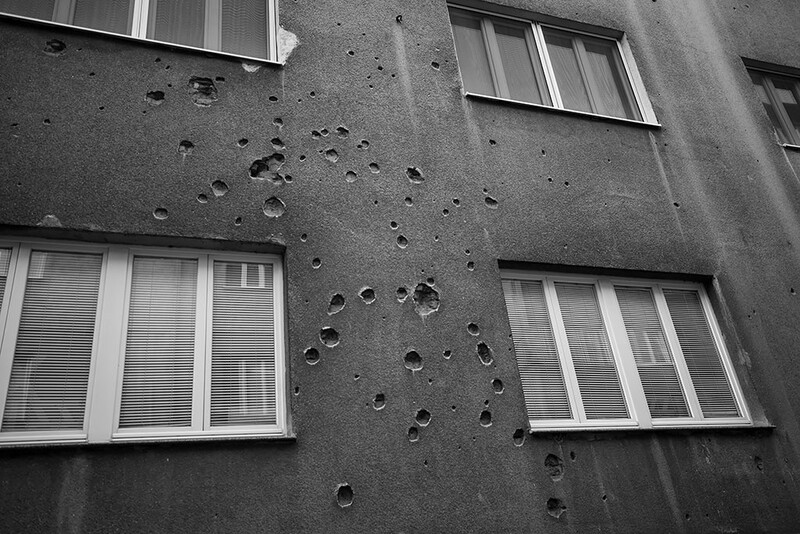 From 1992 to 1995 during the siege of Sarajevo, many foreign journalists set up base in the hotel, despite regular shelling and the hotel’s precarious location on the so-called “Sniper Alley”. BBC correspondent Martin Bell once described it as “the ultimate war hotel". "From there, you didn't go out to the war, the war came in to you." 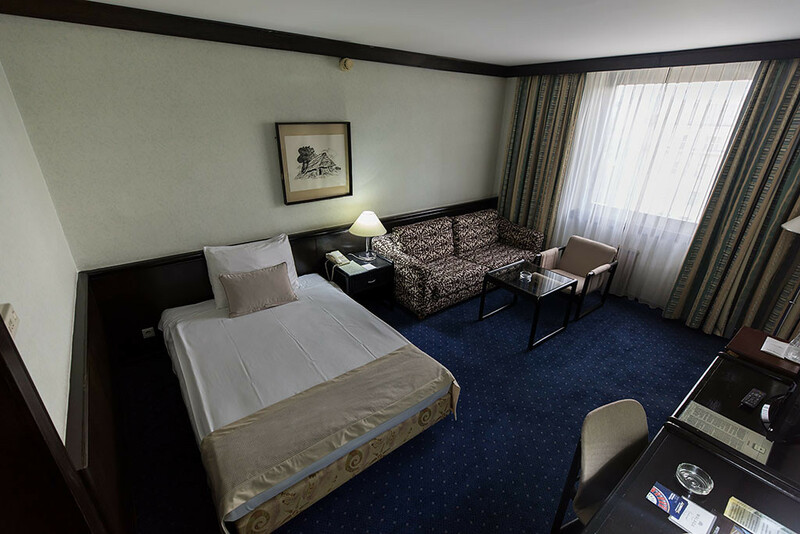 For only €64 a night including breakfast, I couldn't resist spending my only night in Sarajevo at such an historic hotel. After storing my bag at the hotel reception, I headed out for a walk through the city. Some of the buildings still had damage from the war over 20 years ago. 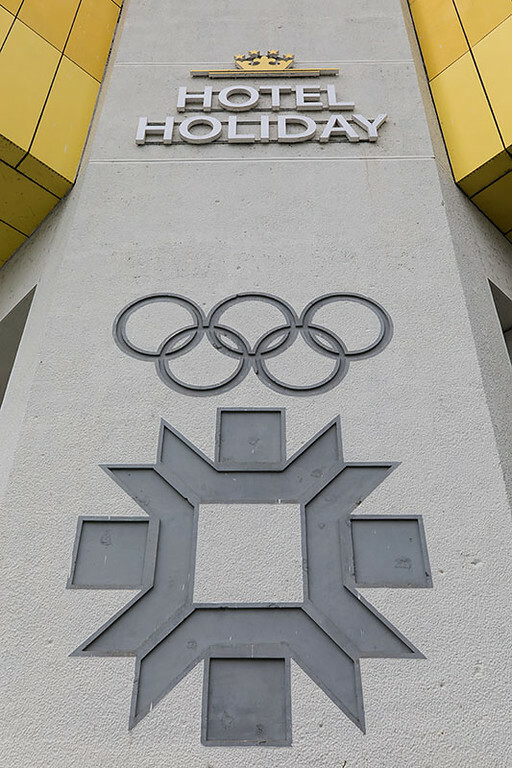 The stylized snowflake logo of the 1984 Winter Olympics on the pavement. 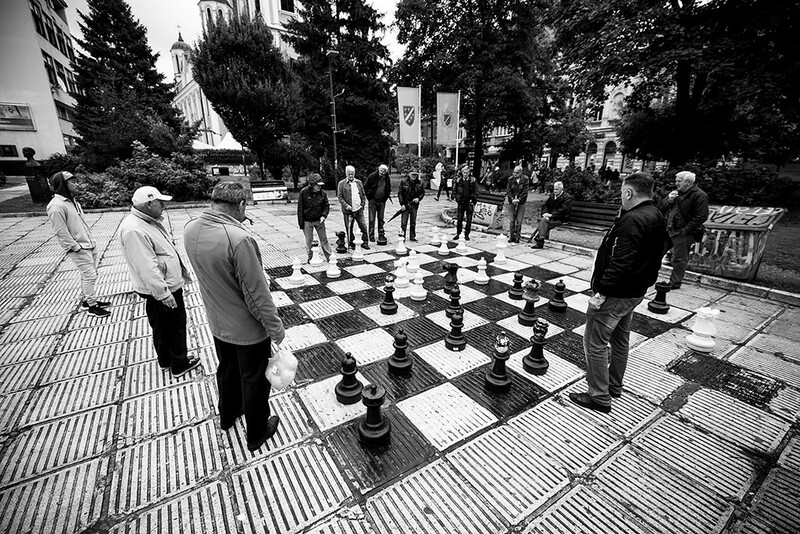 Men playing chess in Trg oslobođenja (Liberation Square), that is dedicated to Alija Izetbegović. Izetbegović became the first President of the newly-independent Republic of Bosnia and Herzegovina in 1992. 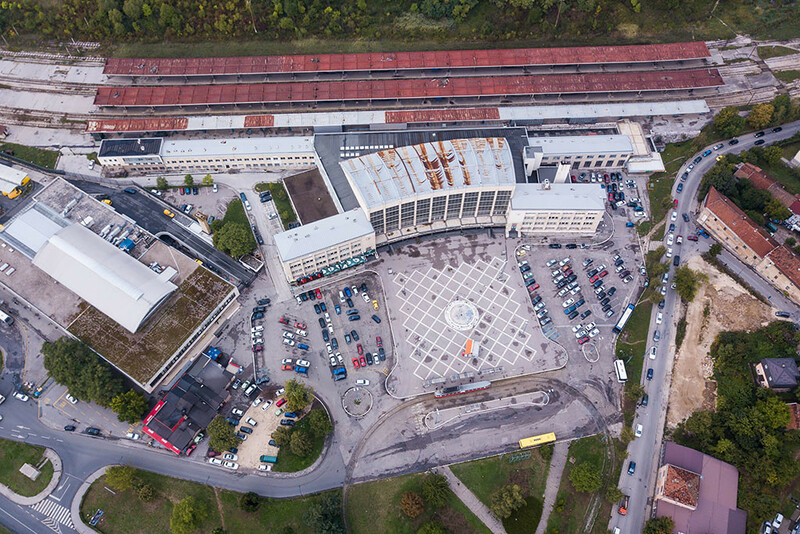 Outside Gradska tržnica (City market). 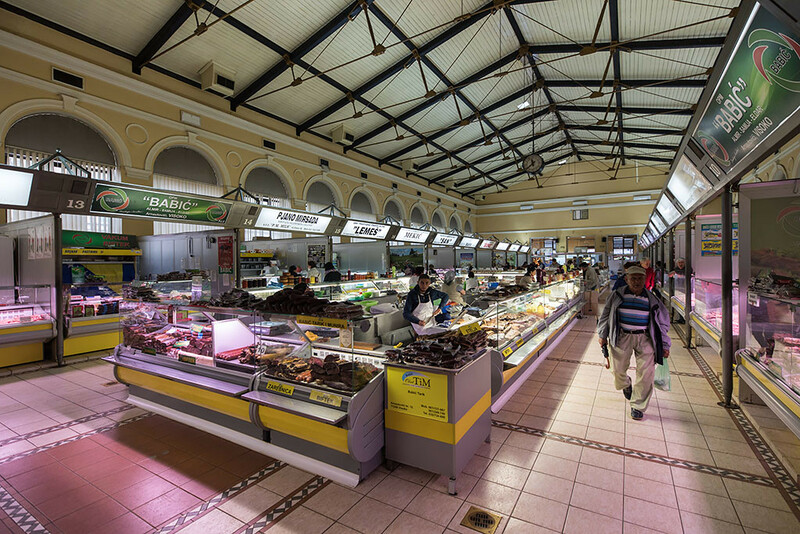 And some tasty and interesting local food for sale inside. 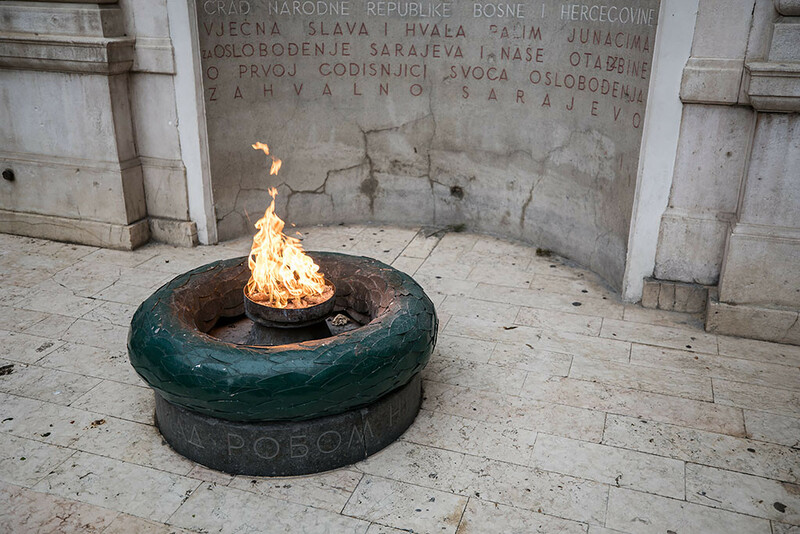 Vječna vatra, a memorial to the victims of the Second World War in Sarajevo. 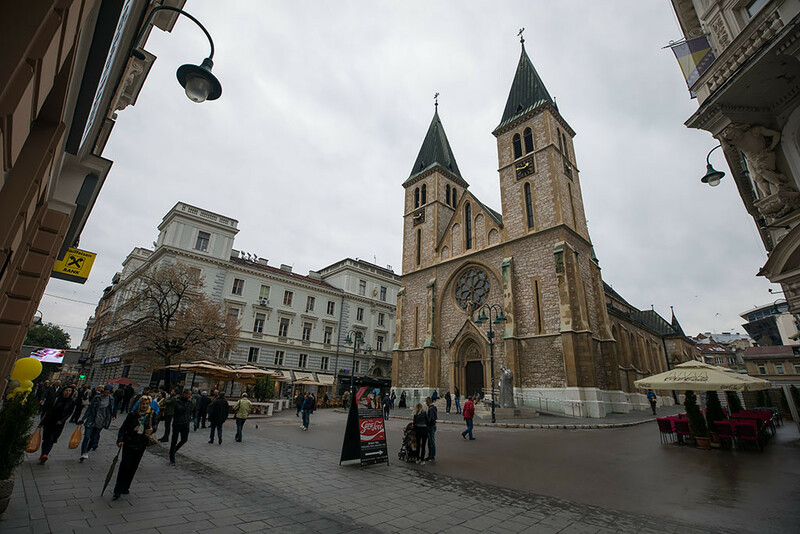 The city was occupied for four years during the war by by Nazi Germany and the fascist Independent State of Croatia. 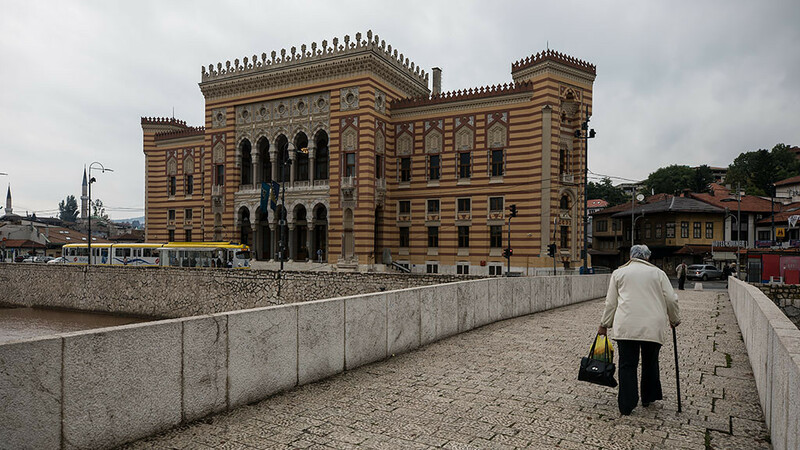 Outside the Sarajevo National Theatre for the meet up point for the Sarajevo walking tour. Our guide for the day, Neno, who had lived as a child in Sarajevo during the siege of the city during the Bosnian War. 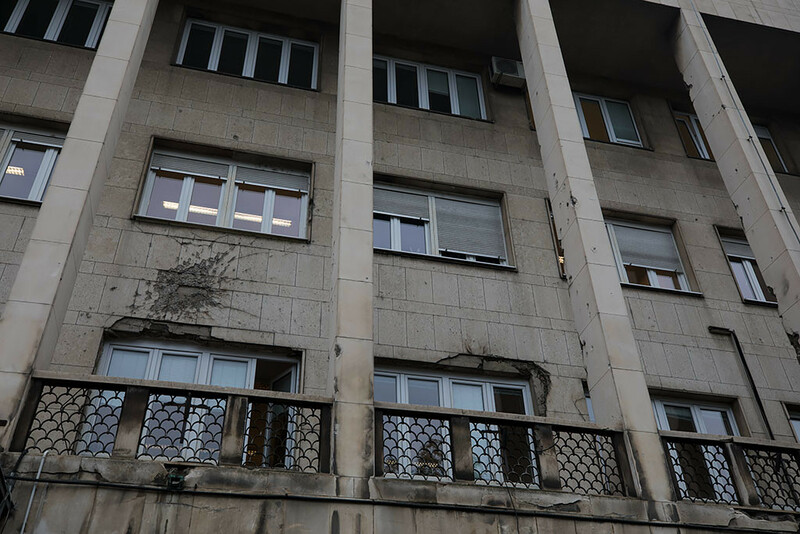 With the communist era apartment blocks being easy targets for Serbian snipers, his family had to live in the building basement. 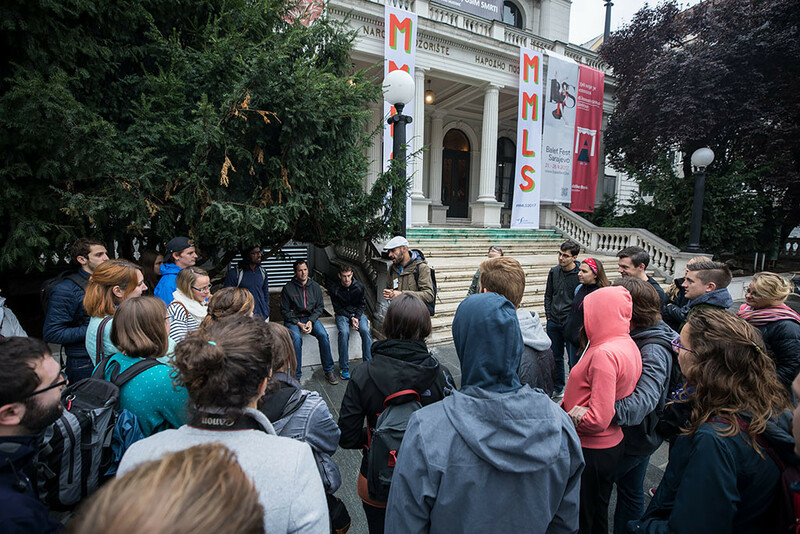 He gave us a brief history of Sarajevo, and how it was founded by the Ottomans in the 1450's. Due to taxes imposed by the Ottomans on other religions, many local Christians converted to Islam at this time. Neno said he himself is agnostic and although his mother is nominally muslim, she has only been to a mosque twice in her life. 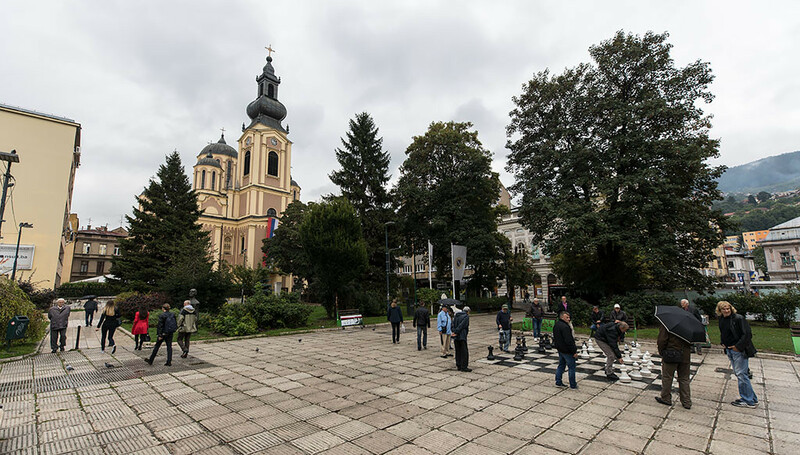 Back at Liberation Square, with Cathedral Church of the Nativity of the Theotokos in the background. 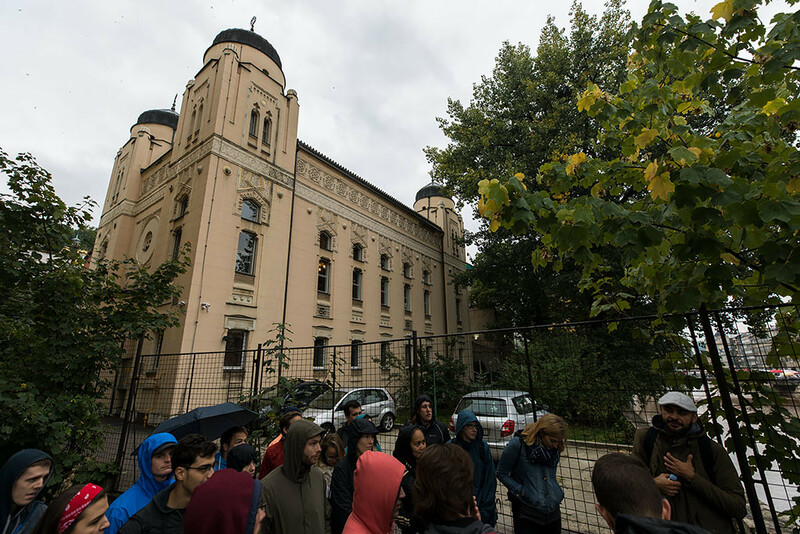 Outside our next stop, Sarajevo Synagogue. Designed by Karel Pařík and built in 1902 in the Moorish Revival which was a popular choice for synagogues in the Ottoman empire. 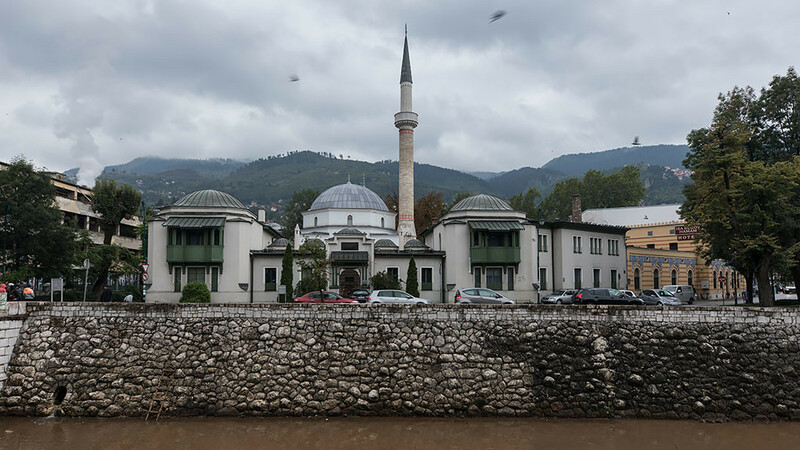 Following the expulsion of Jews from Spain in the 15th century, and the invitation from the Ottoman Empire to resettle their population, Sephardic Jews migrated to Sarajevo. 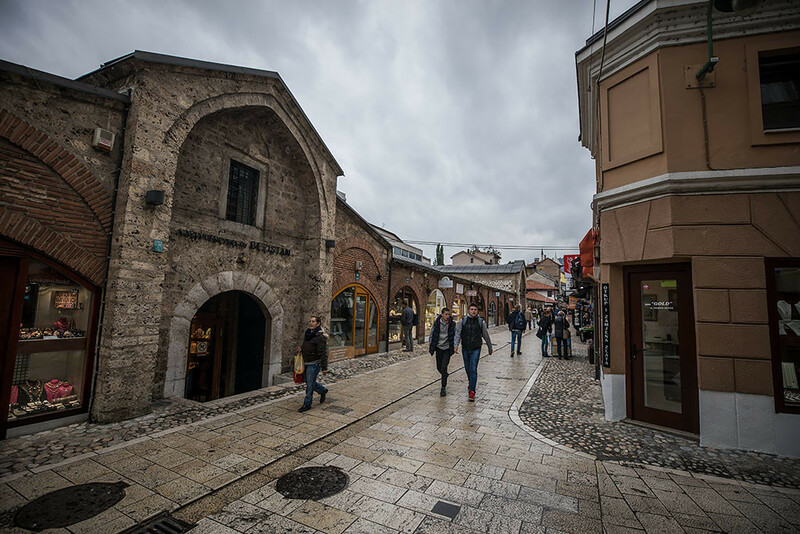 The majority of the Jewish community in Sarajevo were sadly killed however in the Holocaust during the Nazi Occupation in World War 2. We then headed east along the Miljacka river. Latin Bridge over the Miljacka. 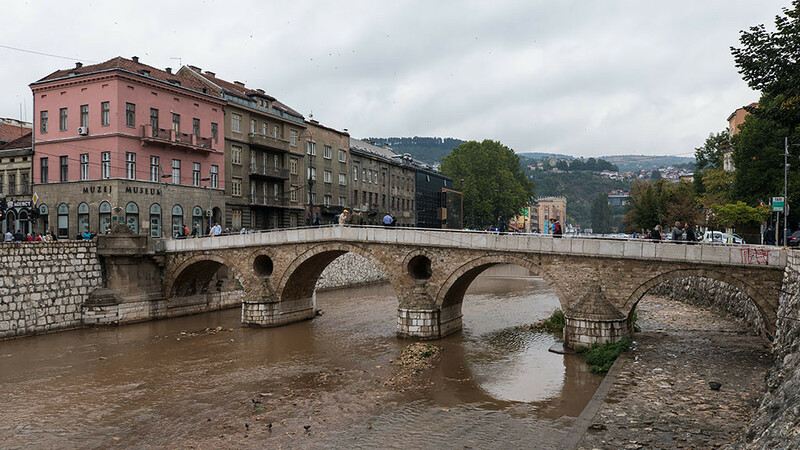 The northern side of the bridge is the site of the assassination of Archduke Franz Ferdinand of Austria by Gavrilo Princip in 1914, which eventually helped precipitate the start of World War I.
Neno gave us a 10 minute break and suggested morning tea at a bakery over the road, where I bought a Zeljanica pastry. Emperor's Mosque, originally built in the mid-fifteenth century but soon damaged and totally destroyed, and then rebuilt in 1565. 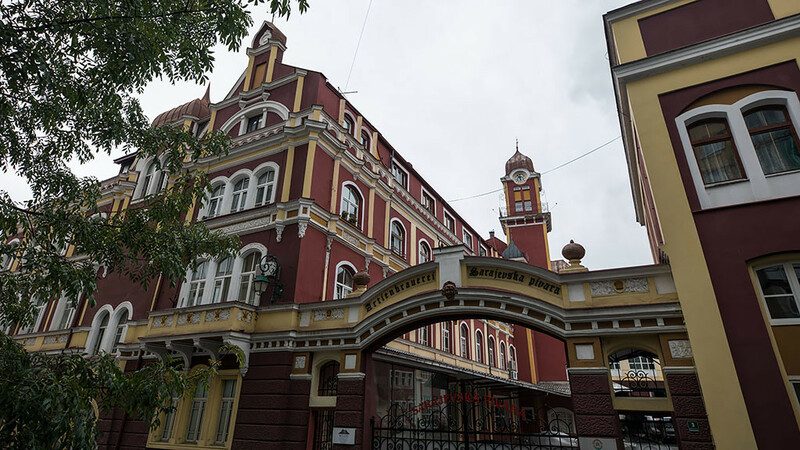 The brewery and headquarters of Sarajevska pivara, founded in 1864. 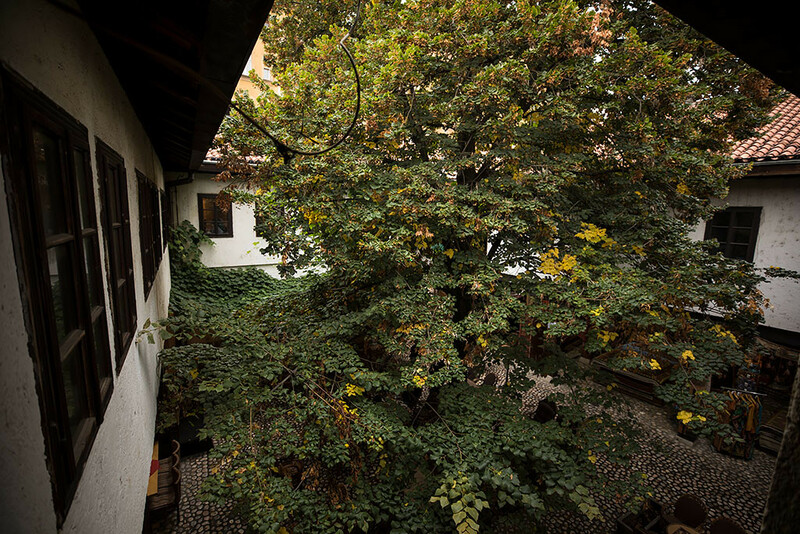 Neno said that the brewery was situated over a spring, and hence helped to continue beer production during the siege of Sarajevo. 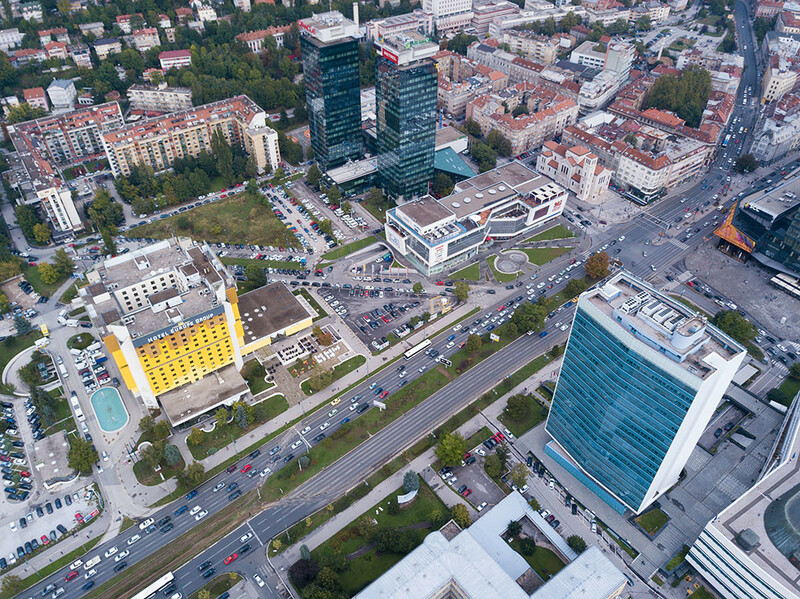 Looking over to Vijećnica, or Sarajevo City Hall, on the northern side of the Miljacka. 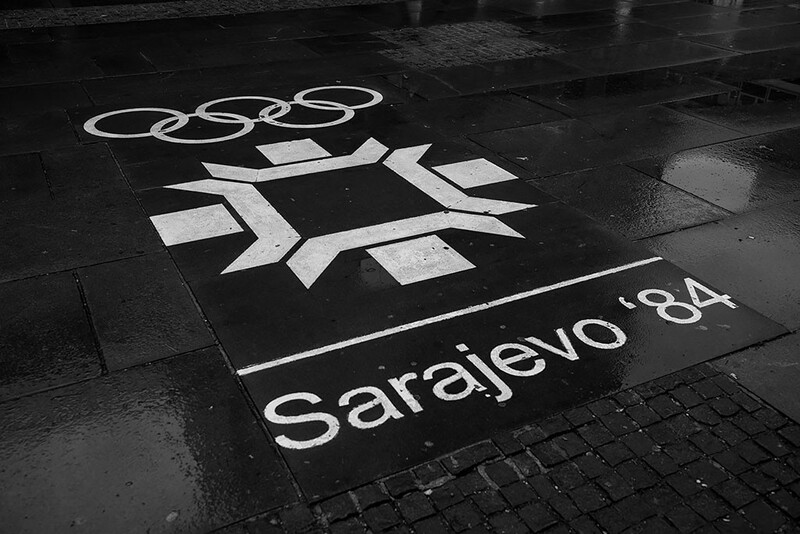 In August 25th, 1992, Serbian shelling during the Siege of Sarajevo set fire to over 2 million books at the City Hall. 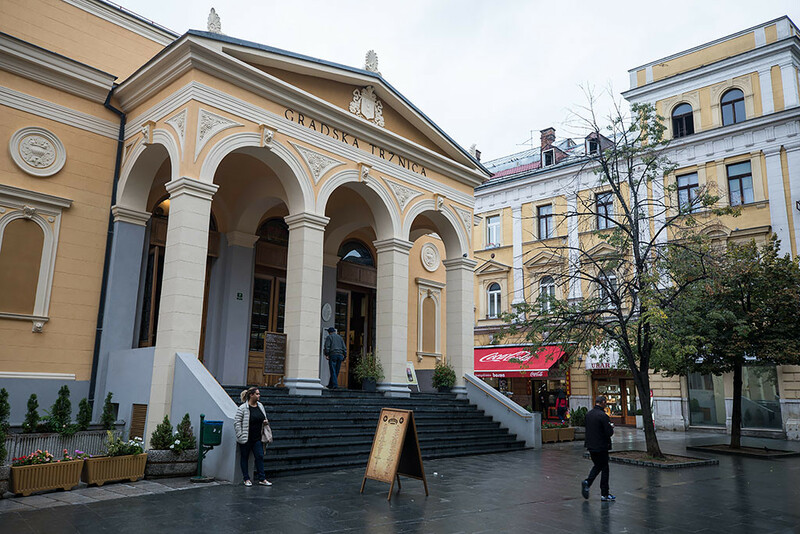 After years of restoration, the building was finally reopened in 2014. 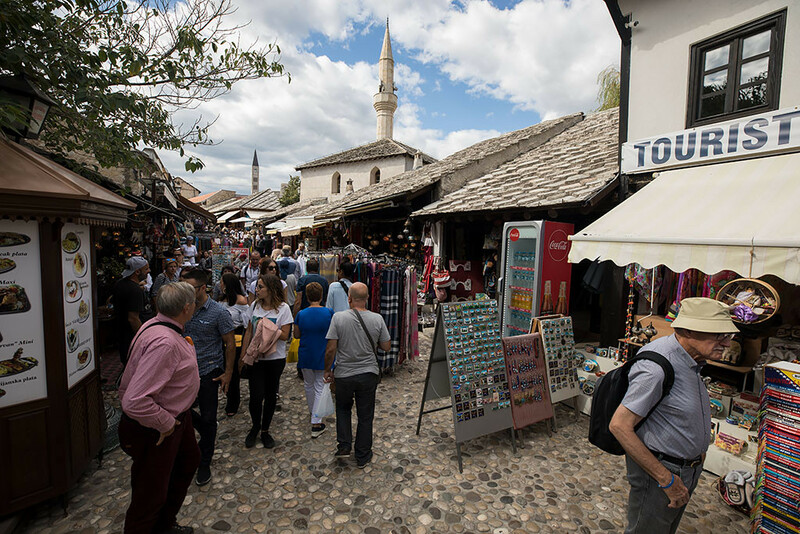 We then continued on to Baščaršija, Sarajevo's old bazaar. 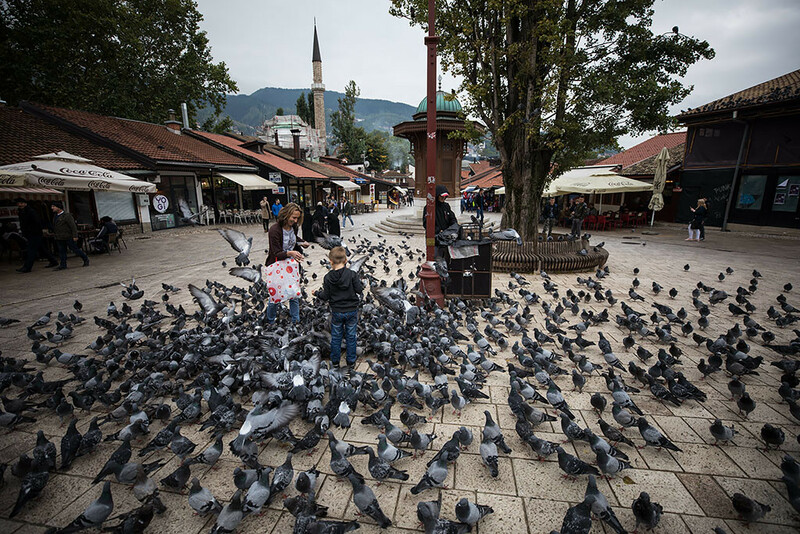 Hundreds of pigeons in Baščaršija square. In the background is the Sebilj, a pseudo-Ottoman-style wooden fountain. 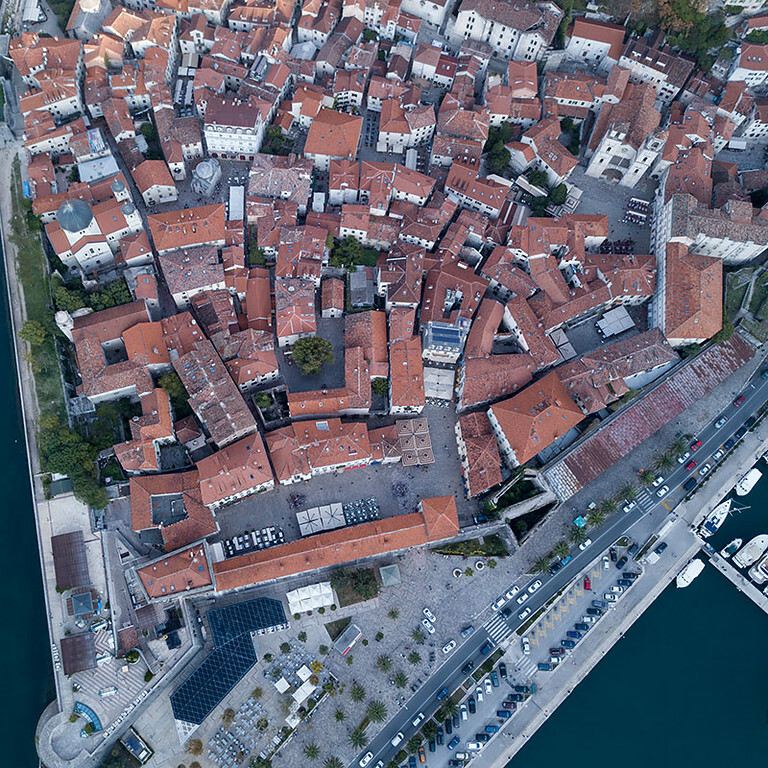 Built in 1462, Baščaršija is the historical and cultural center of the city. 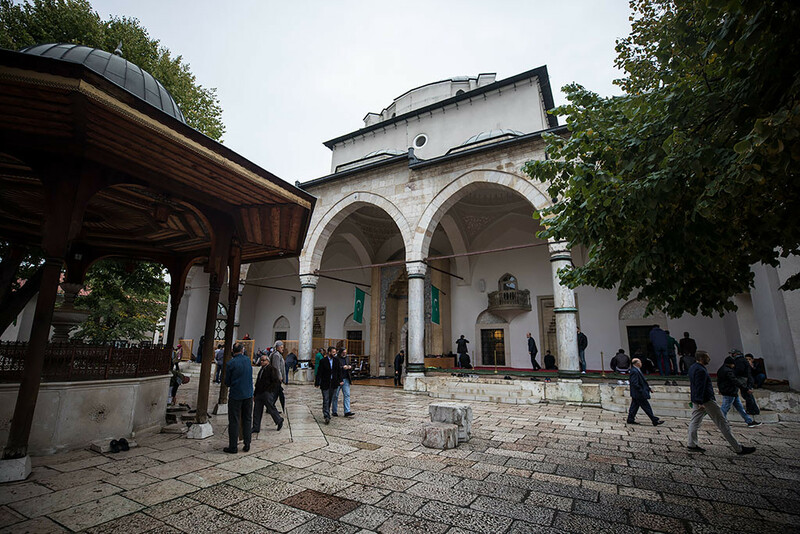 Gazi Husrev-beg Mosque situated inside Baščaršija, where people were performing the midday Zuhr prayer. And at the Sarajevo Caravanserai where we ended our walking tour. 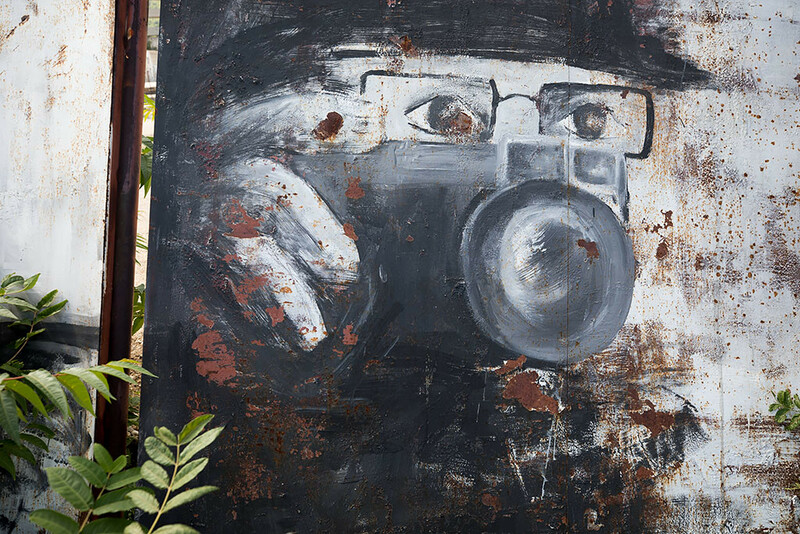 The Caravanserai had been converted into a space for artists. 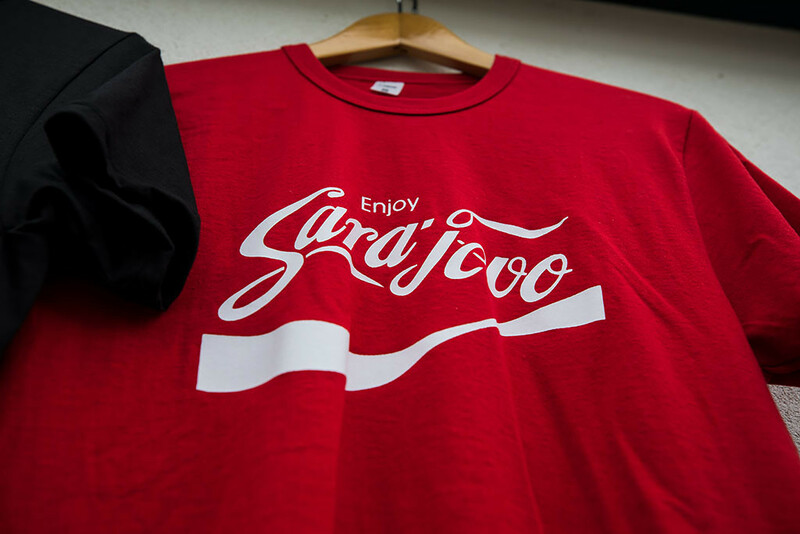 I thanked Neno for the very interesting tour and introduction to Sarajevo. For lunch I headed to a restaurant in Baščaršija and had some Ćevapi. 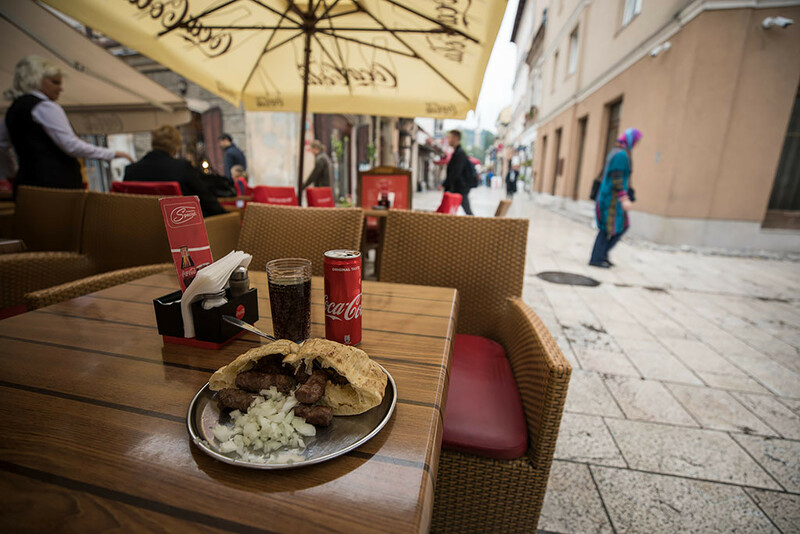 Made from grilled meat, onion and flatbread, it is a national dish in Bosnia and Herzegovina and Serbia. 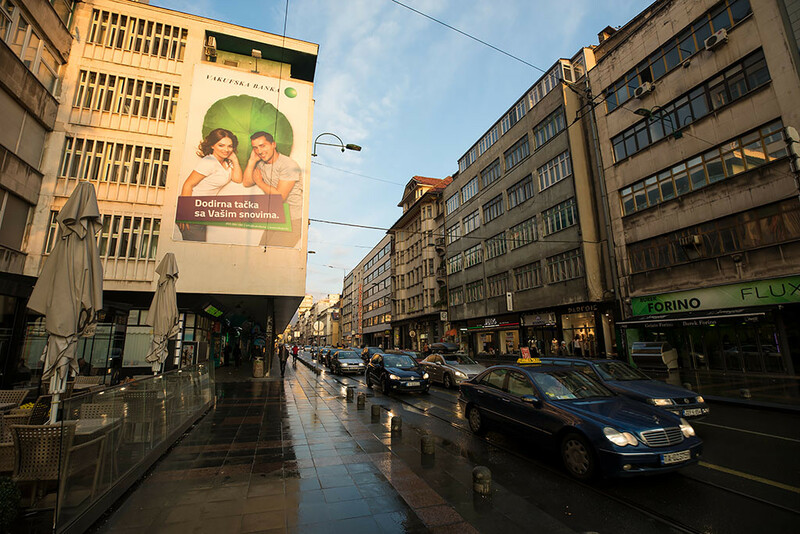 Walking past Katedrala Srca Isusova as I headed west back along Ferhadija Street. And back at the Hotel Holiday, ready to check-in. 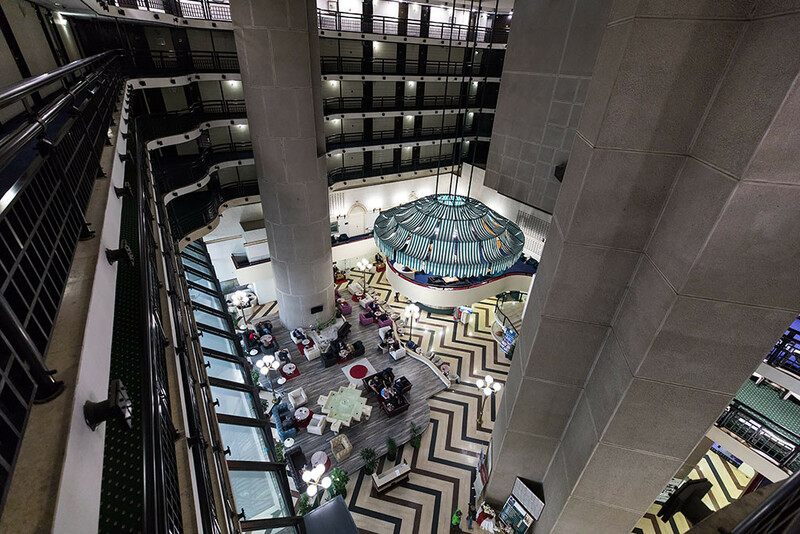 After being bought by an Austrian businessman in 2003 for a reported $23 million, it lost its famous Holiday Inn branding in 2011 and subsequently fell into bankruptcy in 2015. 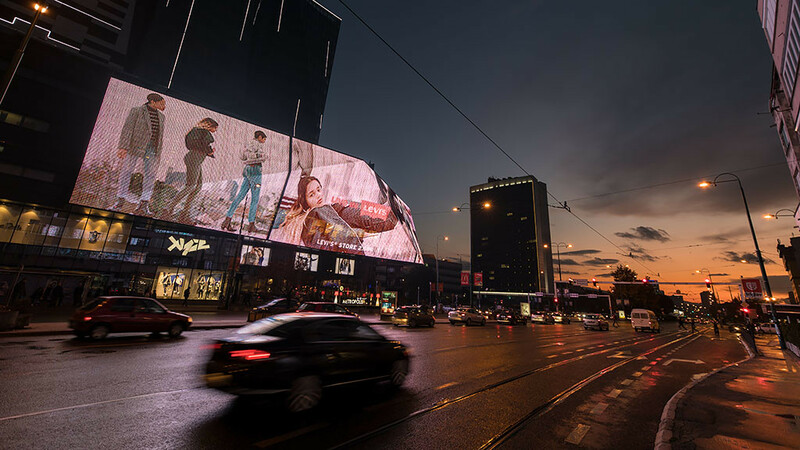 It was purchased by a Bosnian businessman Rasim Bajrović in 2016, who returned to its '80s roots. My room for my one night, complete with classic 1980s décor. It was like stepping back in time, with the navy blue carpet, mahogany furnishings and bright yellow retro bathroom ceramics. Quite a delight! 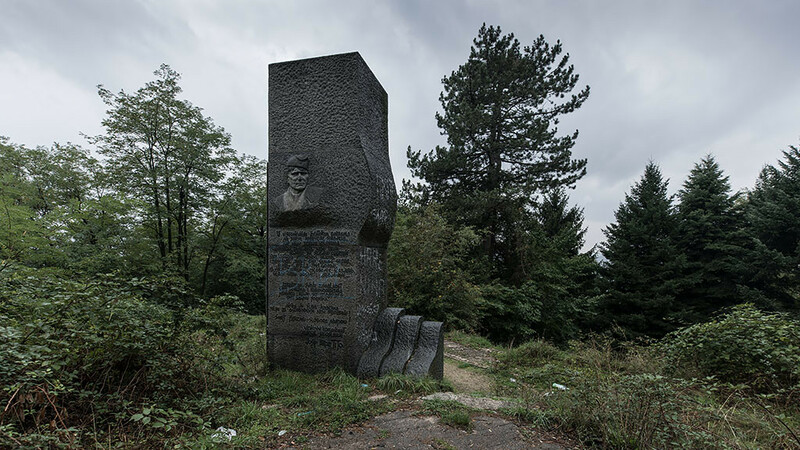 After resting up at the hotel for a bit, I headed for a walk up the hill to Vraca Memorial Park where there was a derelict memorial to comrade Tito, the first and only President of Yugoslavia. From the hill there was good views of Sarajevo below. 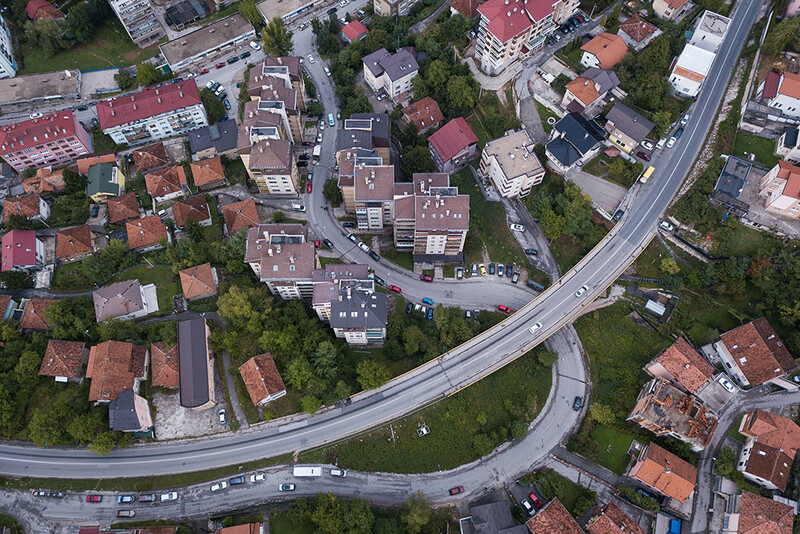 Looking down on some of the houses and roads on the south side of the Miljacka. 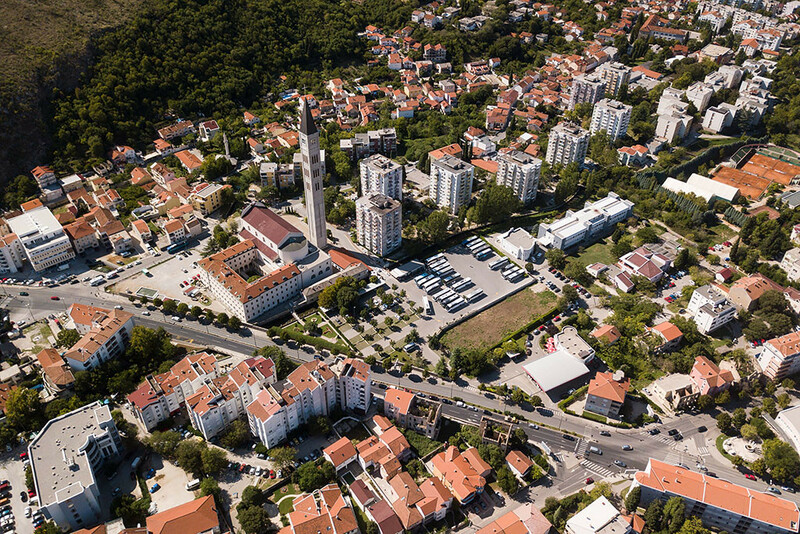 The centre of town with the National Museum of Bosnia and Herzegovina at bottom left, the bright yellow Hotel Holiday at centre and the Parliament of Bosnia and Herzegovina on the bottom right. 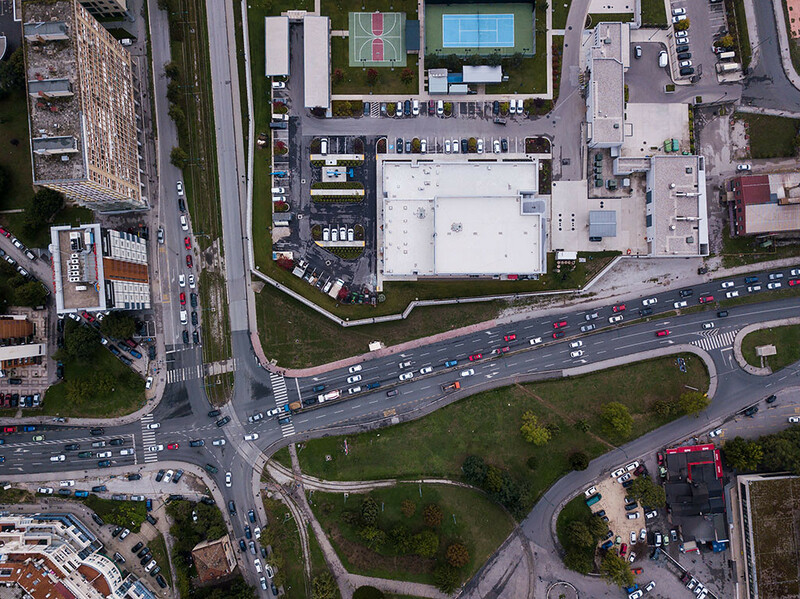 A closer view from above of the Hotel Holiday. 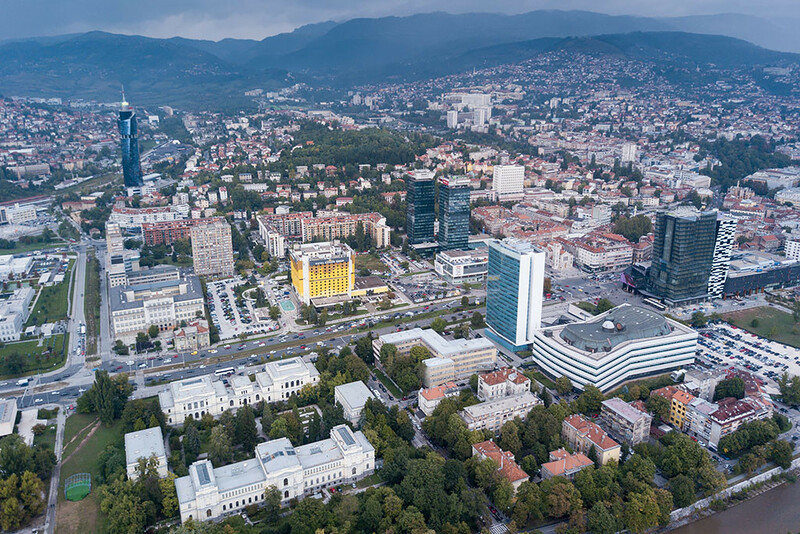 A panoramic with Avaz Twist Tower, the tallest skyscraper in the Balkans, on the far left. 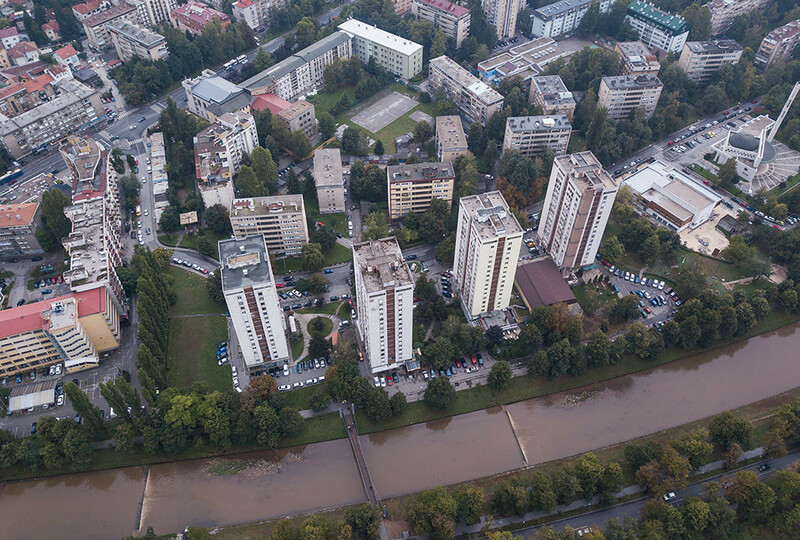 Apartment blocks along the muddy Miljacka river. I then walked back down the hill towards the hotel. 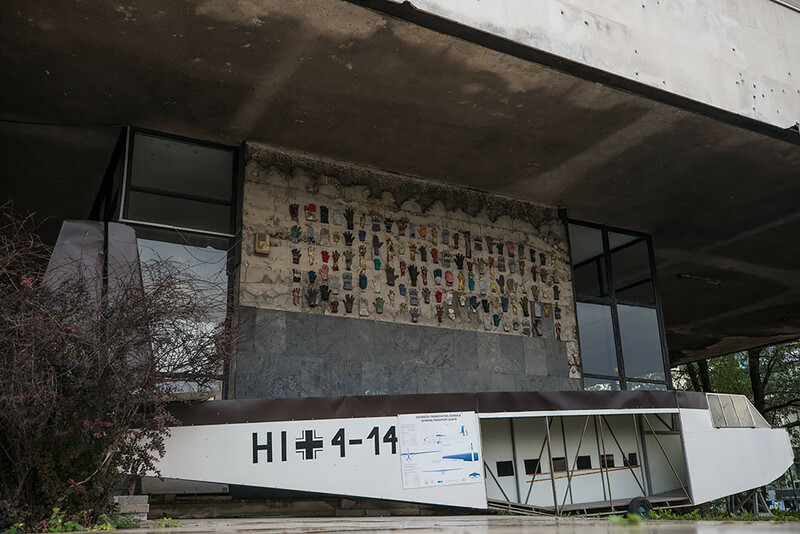 An interesting display outside the ruined building of the Historical Museum of Bosnia and Herzegovina. 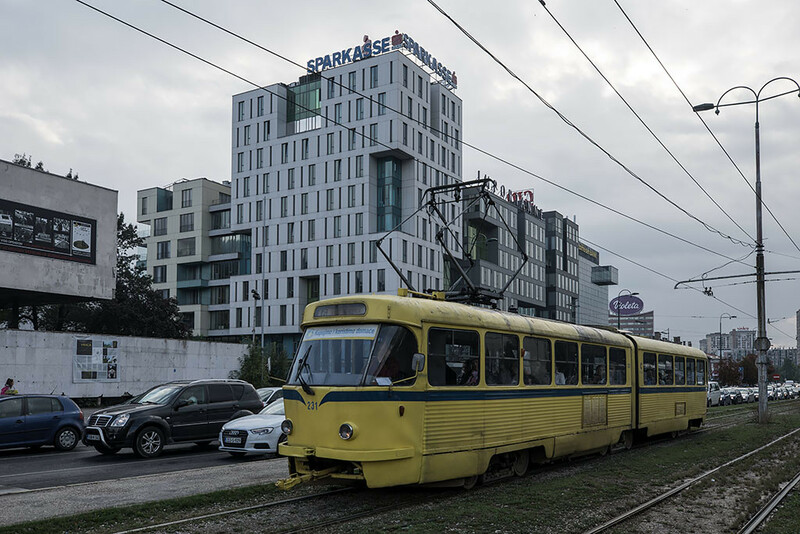 A yellow Tatra K2 tram from the Czech Republic, dating from the 1970's. And back at the Hotel Holiday. I was really loving the retro 80's interior! In the evening I headed out for a walk through the city again. 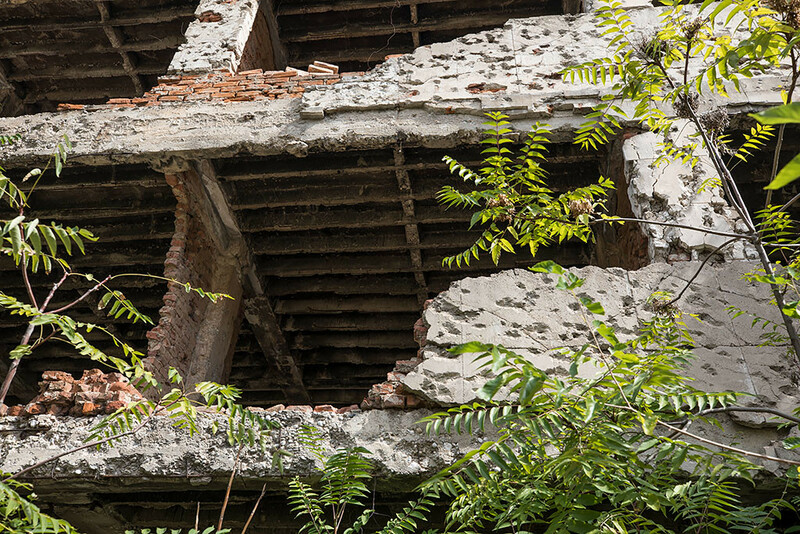 Damage to a building left over from the war. Blue skies finally appearing after the overcast day. 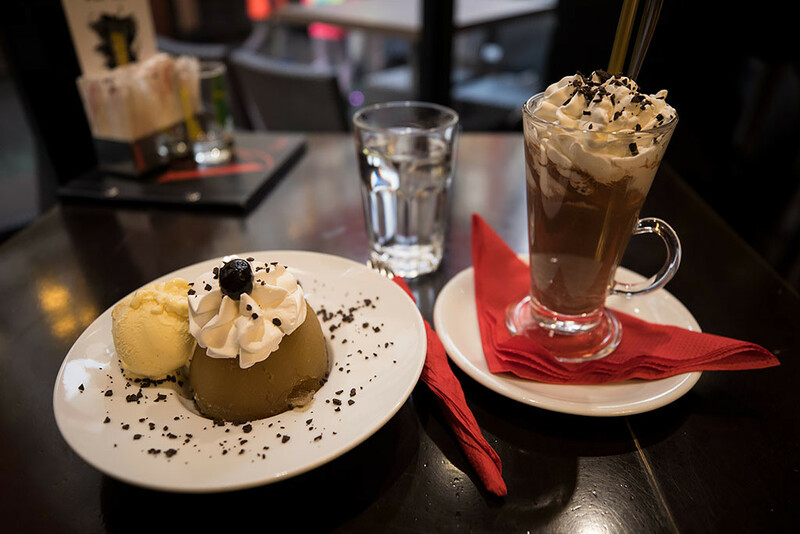 I wasn't too hungry after the late lunch so enjoyed a hot chocolate and some Tufahije (a Bosnian dessert consisting of a walnut-stuffed apple stewed in water and sugar) for a very sweet dinner. I then walked along Maršala Tita back to the hotel after a great first day in the Balkans. Breakfast in the hotel at the start of day 2. 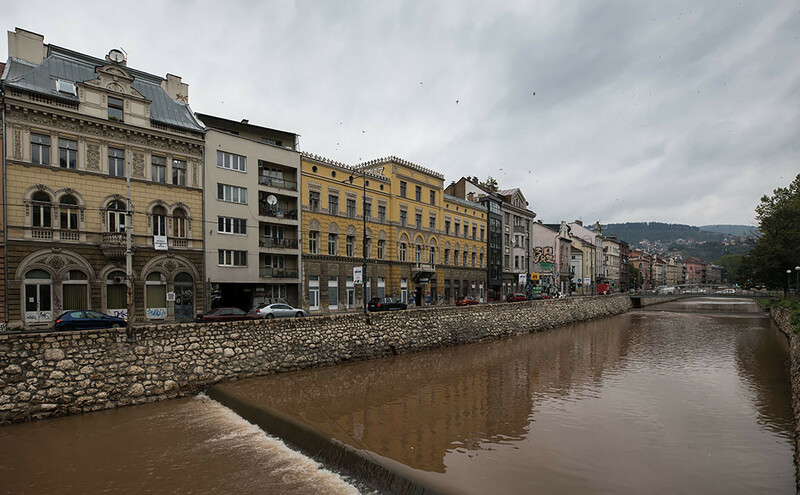 During the siege of Sarajevo, the hotel staff, some dodging snipers' bullets on the way to work, managed to master the art of hostelry in wartime. 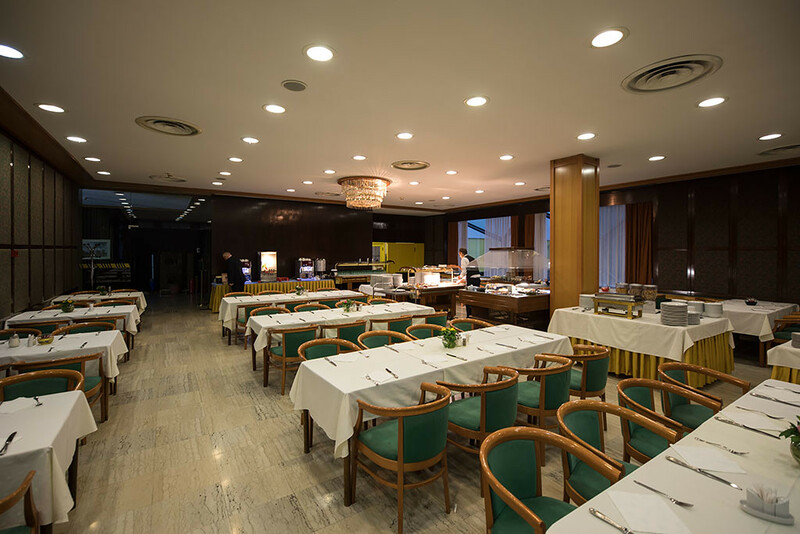 Food for the guests was often cooked on an open fire in the kitchen, and oil for the hotel's electricity generator was bought on the black market with the foreign currency brought in by the foreign journalists. 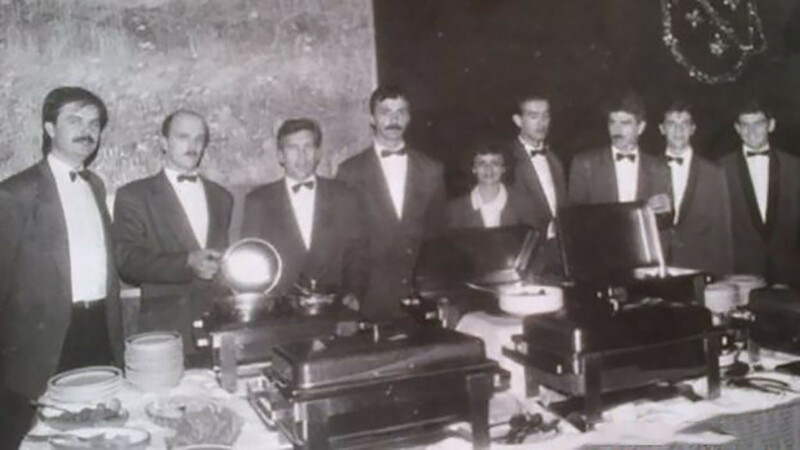 A wartime photo of the hotel staff keeping up appearances for the New Year's Eve buffet in 1993, despite the numerous challenges of operating a hotel in a city under siege. 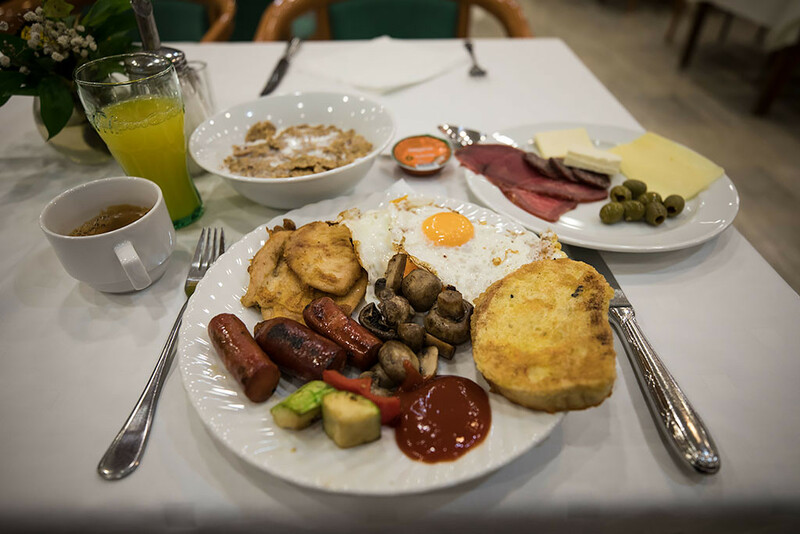 Quite a decent breakfast from the buffet. 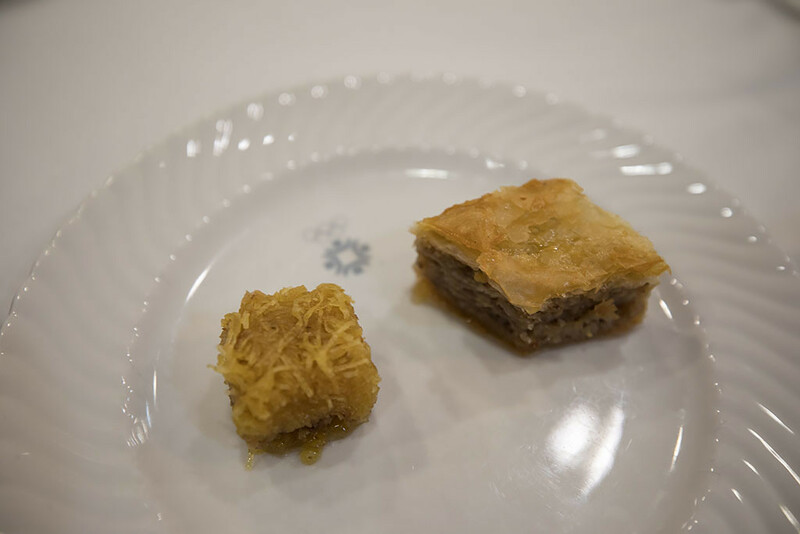 And I couldn't resist having some of the baklava too. 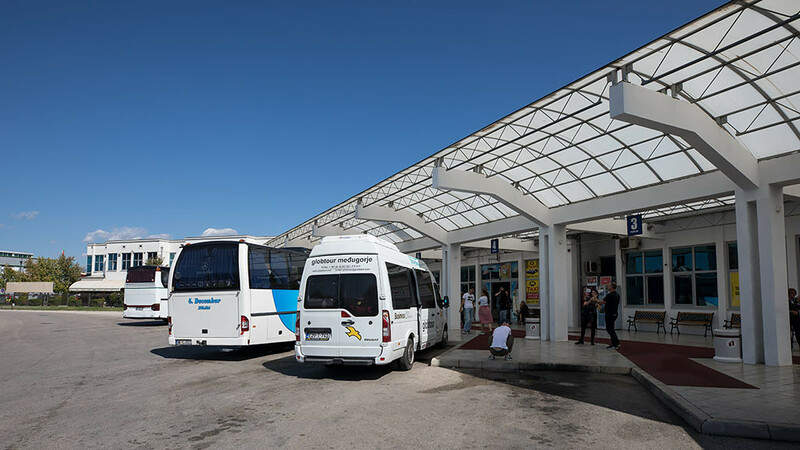 After checking out of the hotel, I headed out to the bus station to begin my journey south. 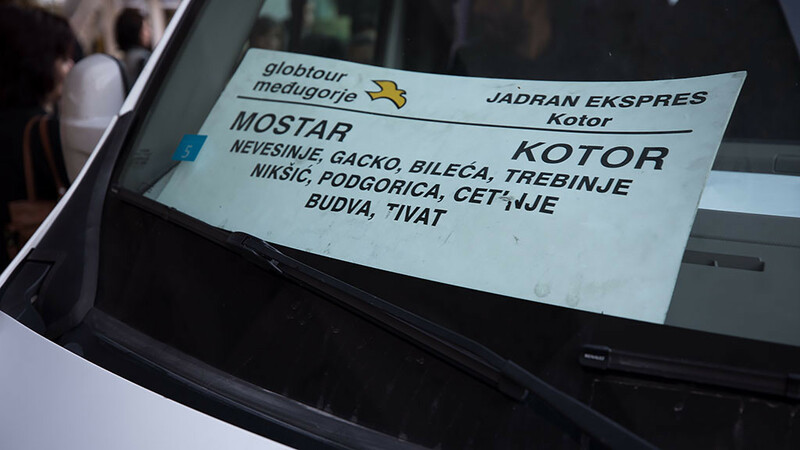 The plan for the next few days was to first head to Mostar for a night and then head over the border to Kotor in Montenegro. I would then head to Dubrovnik in Croatia for two nights. 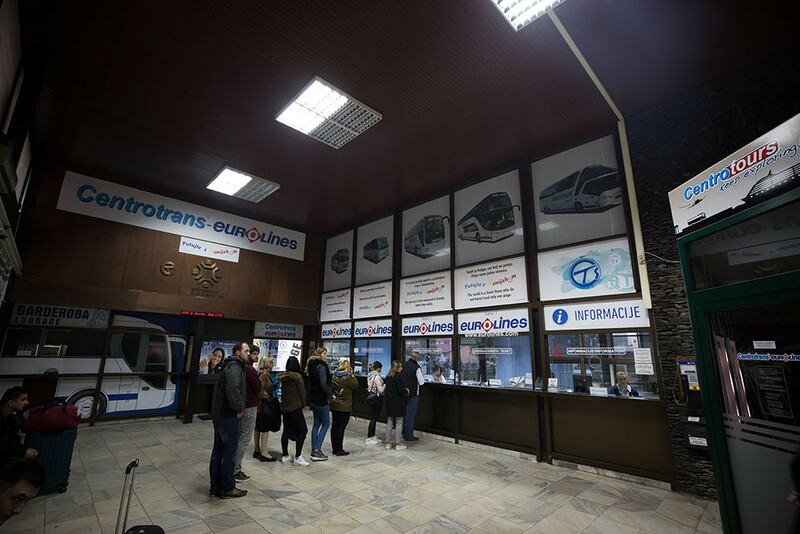 At Autobuska Stanica Sarajevo, where I joined the queue to pay the €1 bus station fee. I had booked and paid all my bus station tickets for the trip online, but had to pay for bus station and luggage fees on the day. 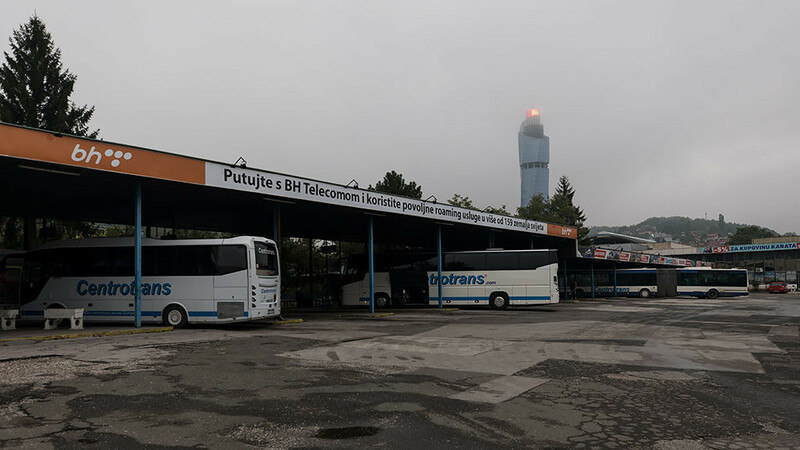 Waiting before the 8:15am departure to Mostar with the glowing red top of the Avaz Twist Tower just behind. 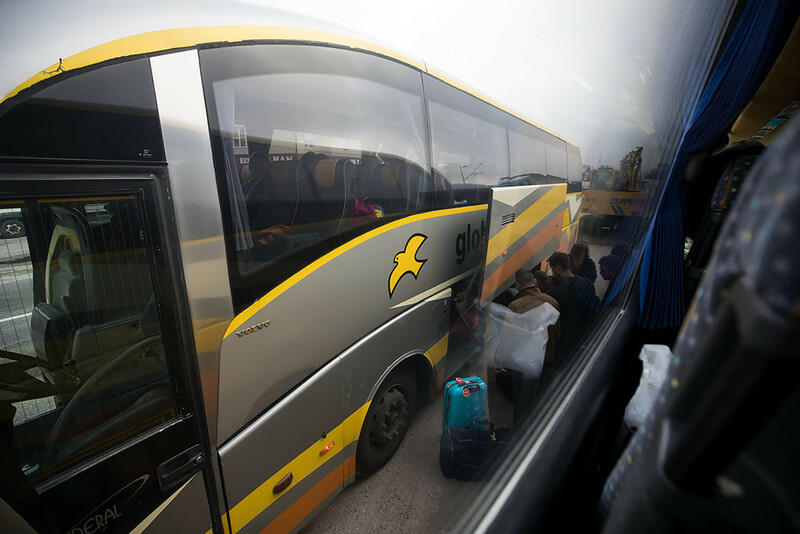 Transferring buses on the edge of Sarajevo. Green pasture as we head south to Mostar. 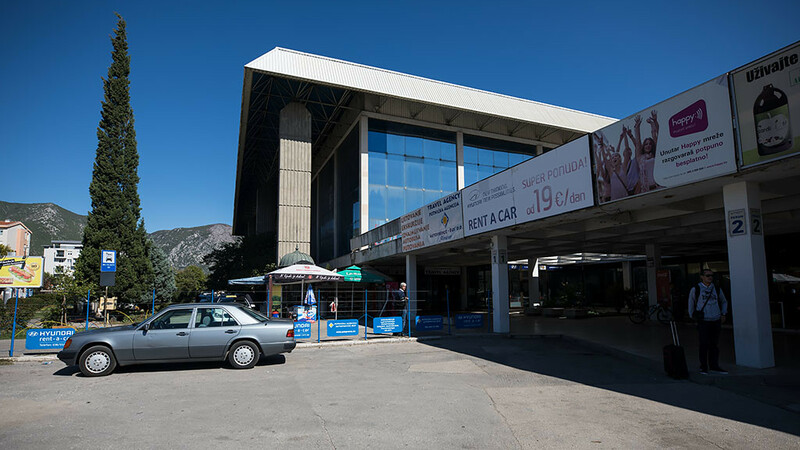 And arriving at Autobuska stanica Mostar just after 11:30am. It was still a little early to check into my Airbnb, so I went for a walk up the hill on the eastern edge of town. 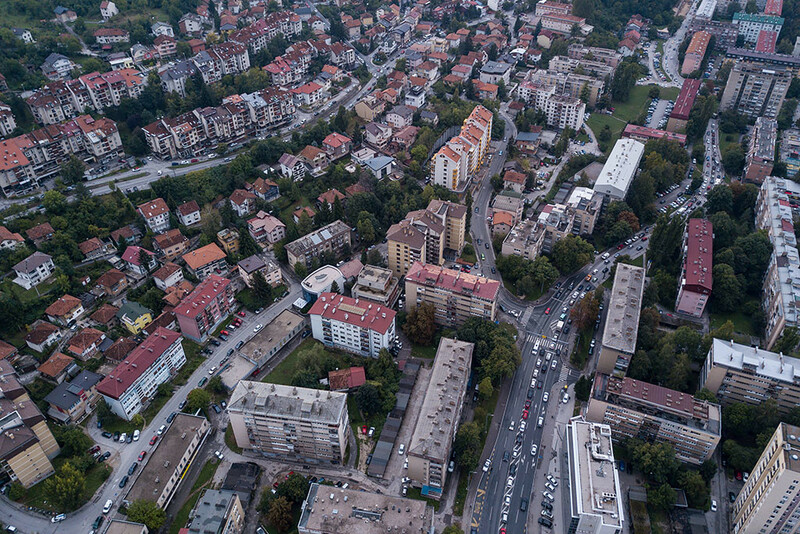 A panoramic of the city below. 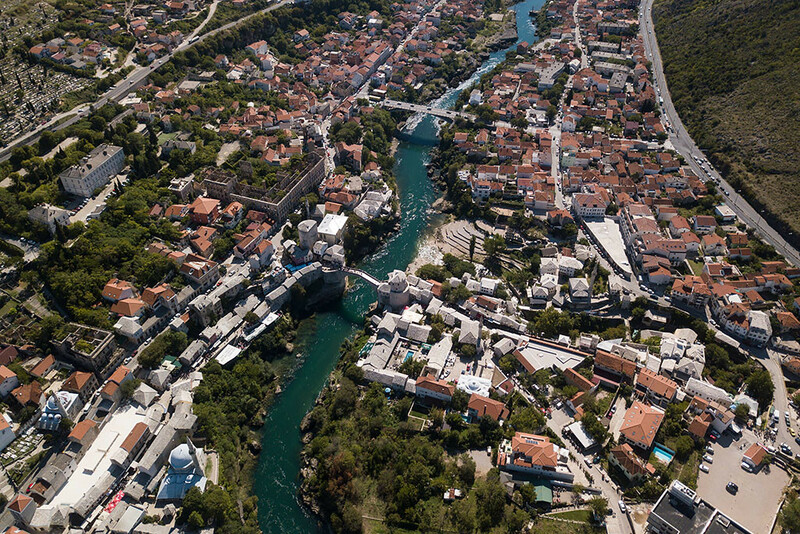 Mostar has a population of just over 100,000 and is the fifth-largest city in the country. 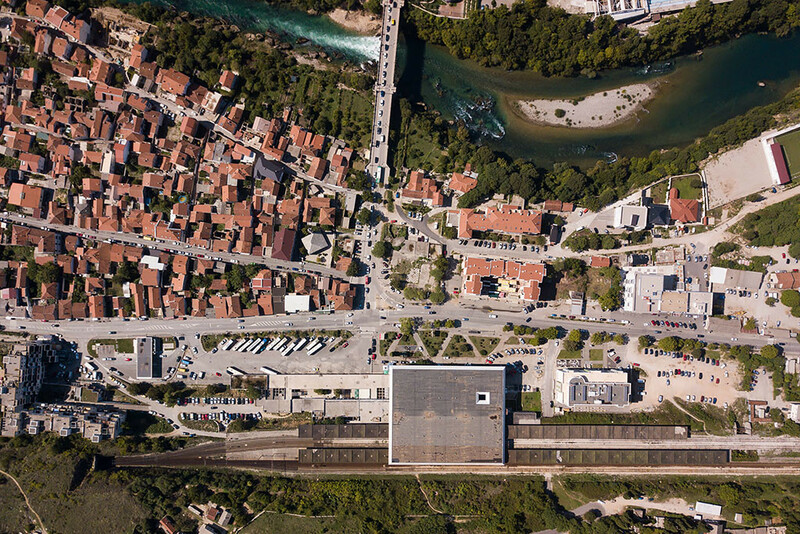 Looking down on Mostar Bus and Train Station. 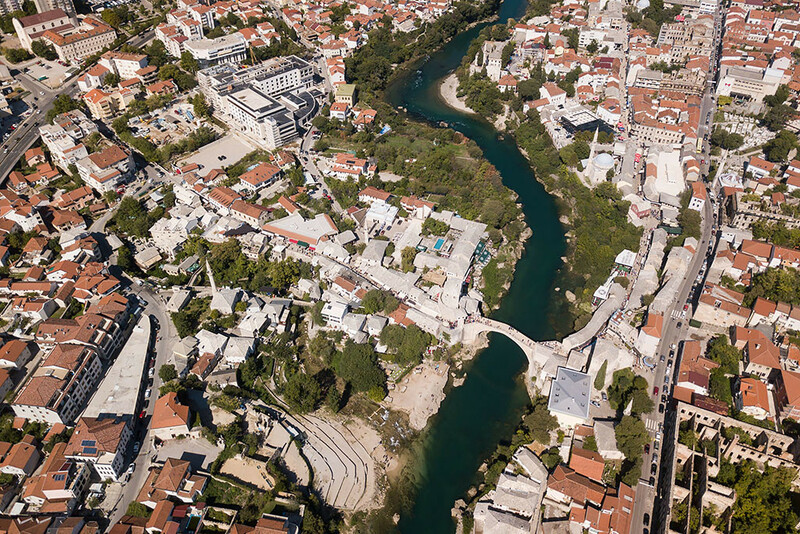 Mostar is situated on the Neretva River. 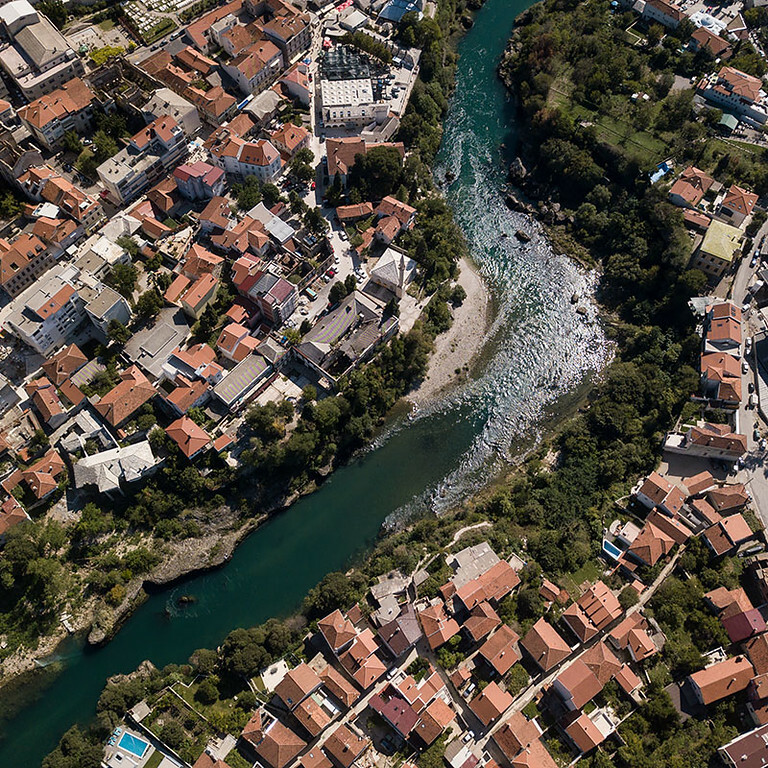 The river winding its way through Mostar. 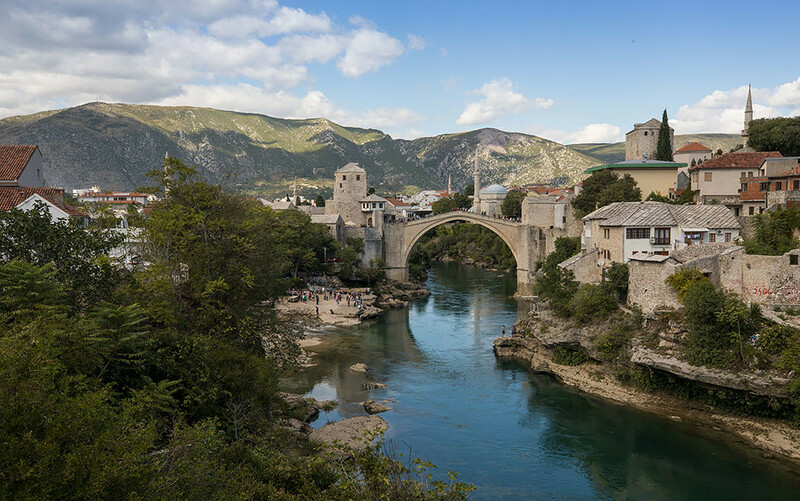 Visible centre is the famous Stari Most (Old Bridge). 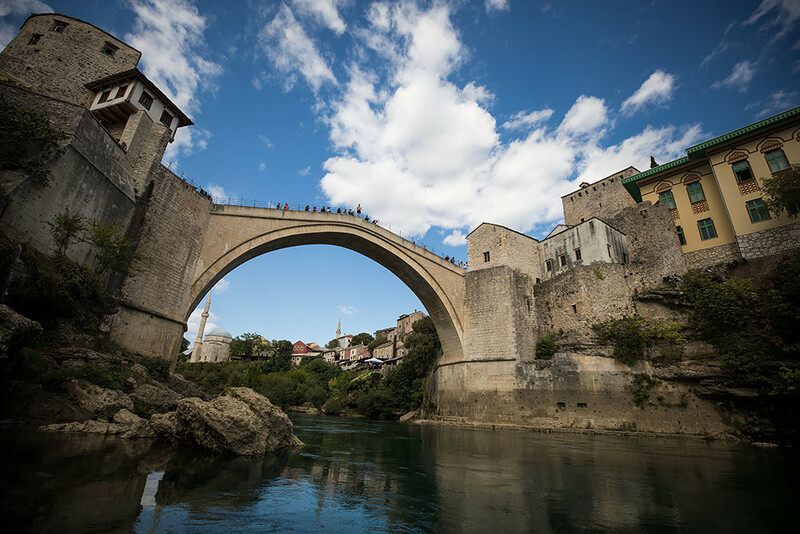 Mostar is named after the bridge keepers (mostari) who in the medieval times guarded the Stari Most over the Neretva. 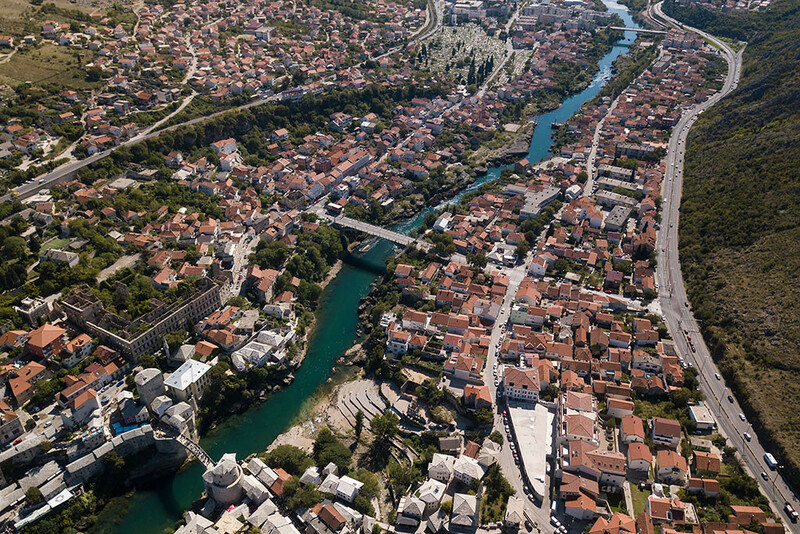 Looking to the north with the Old Town on either side of the Stari Most. Middle left is the tall bell tower at Saint Peter and Paul Monastery. 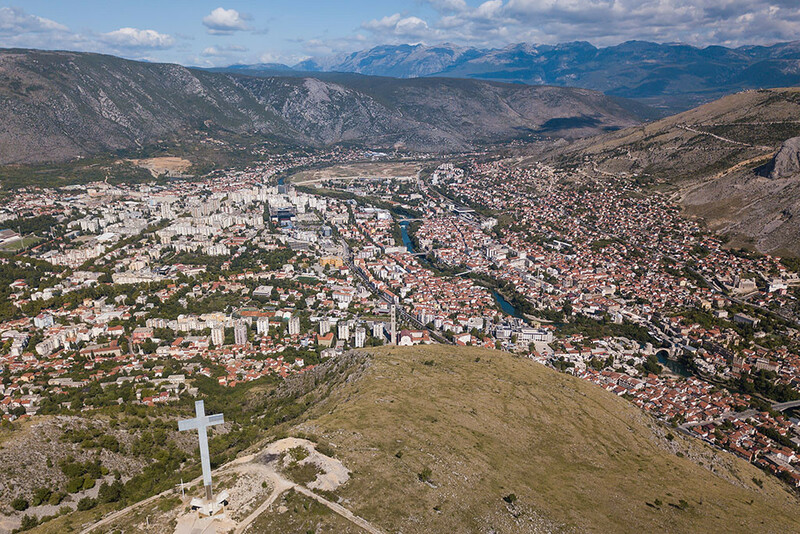 The 30 metre tall Križ na Humu, overlooking Mostar from the hilltop. 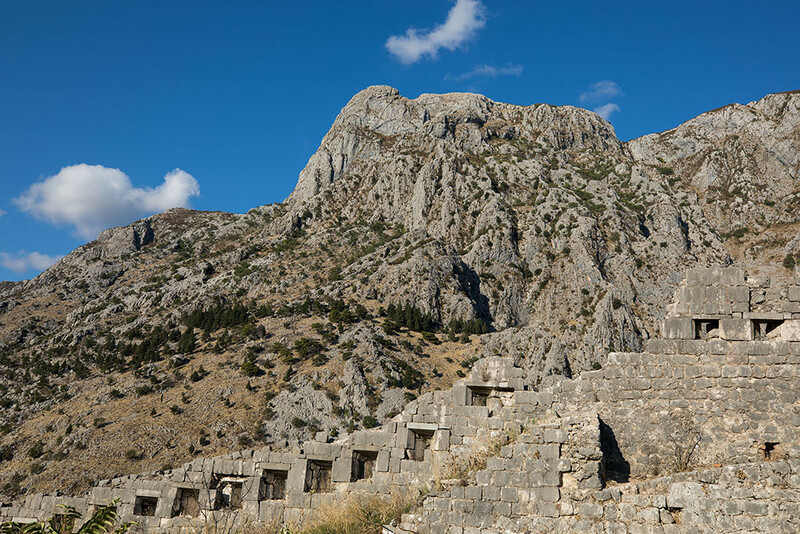 The mountain range of Prenj in the Dinaric Alps visible in the background. 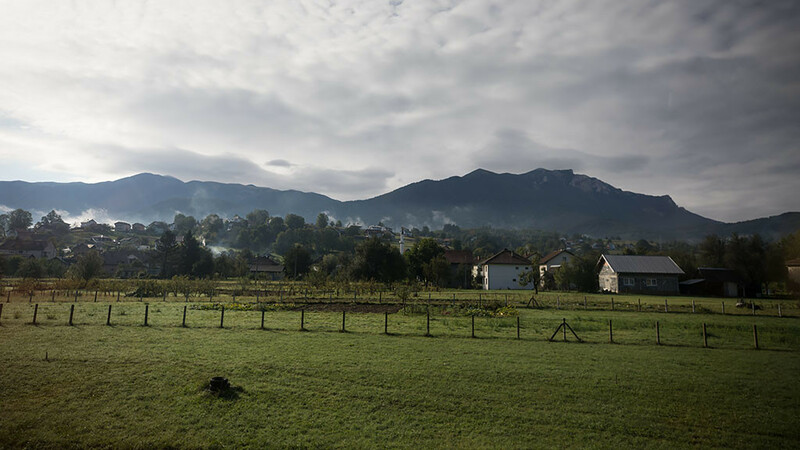 The Prenj mountains were part of the front line during the 1992–95 Bosnian war and are still littered with land mines and unexploded ordnance. 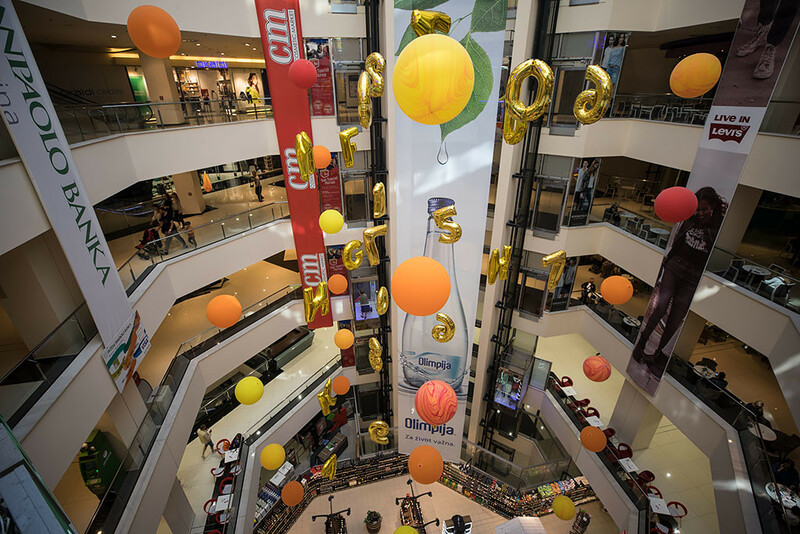 I then headed into the city and headed to a local mall to buy a new lightning cable for my phone. A war damaged and abandoned building as I walked along Ante Starčevića. 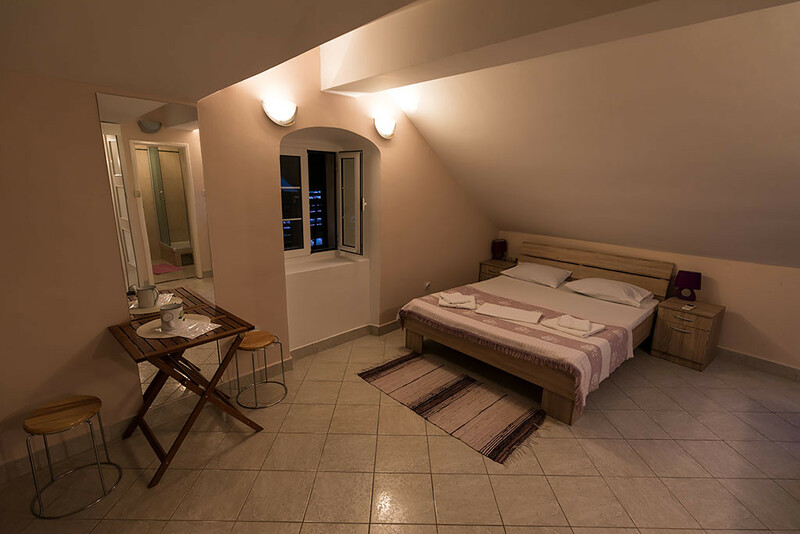 And at my Airbnb for my one night stay in Mostar. 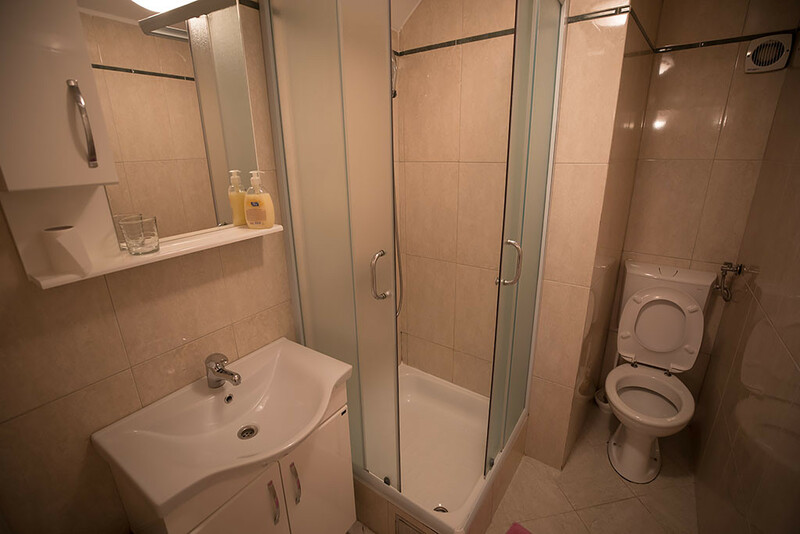 Only €35 per night. 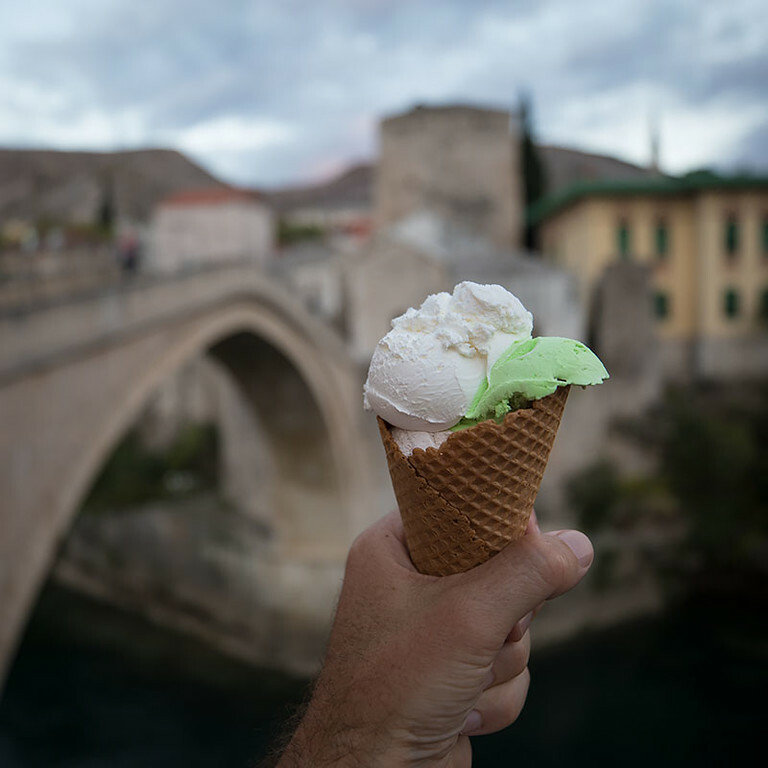 The Airbnb was situated right on the Neretva River and just south of the Stari Most and had a perfect view of the bridge from the balcony. At about 2:30pm I went for a walk through the Old Town, with plenty of other tourists about. 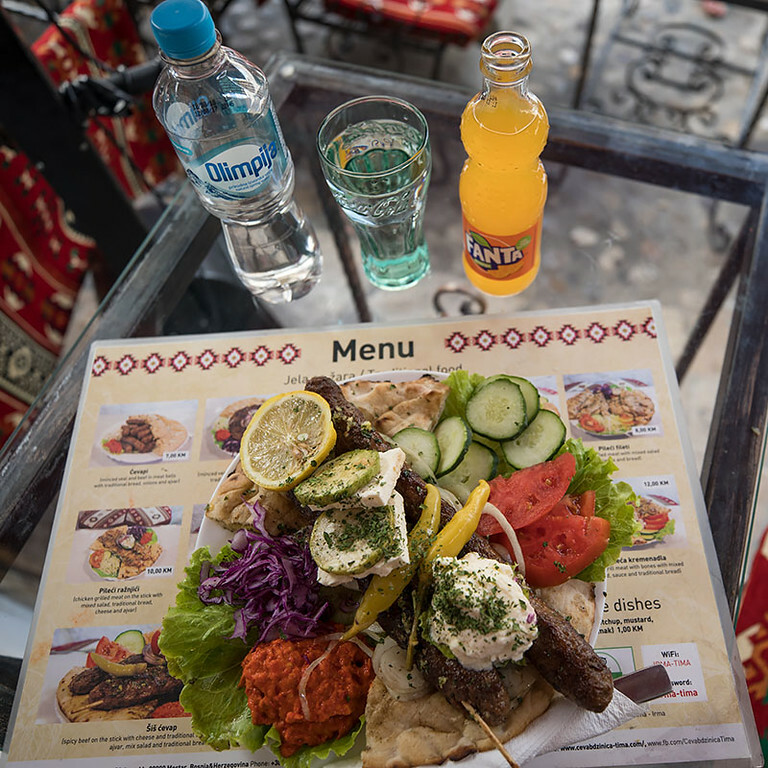 Spicy beef kebab and a bottle of European Fanta (i.e. made with real orange juice) for lunch at a local restaurant. Looking up at a diver about to take the plunge into the cool water of the Neretva River from Stari Most. My guidebook said that for a small fee the local divers will give you a wetsuit and some lessons on how to safely dive off the bridge. I didn't see any brave/foolish tourists making the plunge today though. 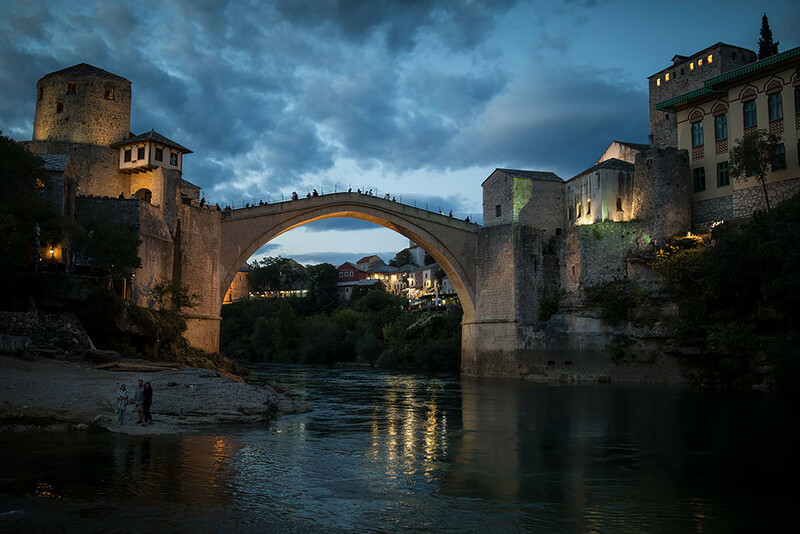 Stari Most was built in the 16th century, is one of Bosnia and Herzegovina's most recognizable landmarks and is considered as one of the most significant pieces of Islamic architecture in the Balkans. 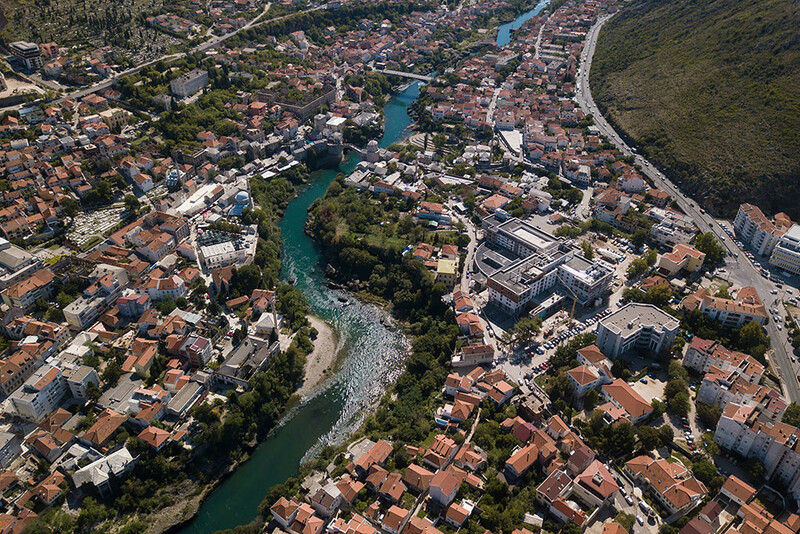 During the Bosnian War, Mostar was a divided city between the eastern and western sides of the Neretva River. 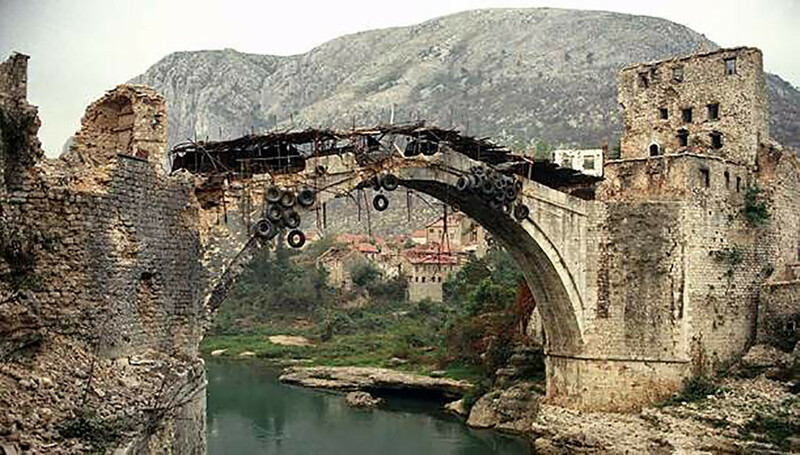 After receiving heavy damage throughout the war, the bridge was blown up by a tank on the 9th of November, 1993. A photo of the damaged bridge before it was completely destroyed. Following the war, there was significant effort and expense to reconstruct the bridge using stone from local quarries and recovered stones from the original bridge from the river below. The reconstructed bridge was inaugurated on the 23rd of July, 2004. In the evening I went through the Old Town again, with thankfully the number of other tourists now thinned out. 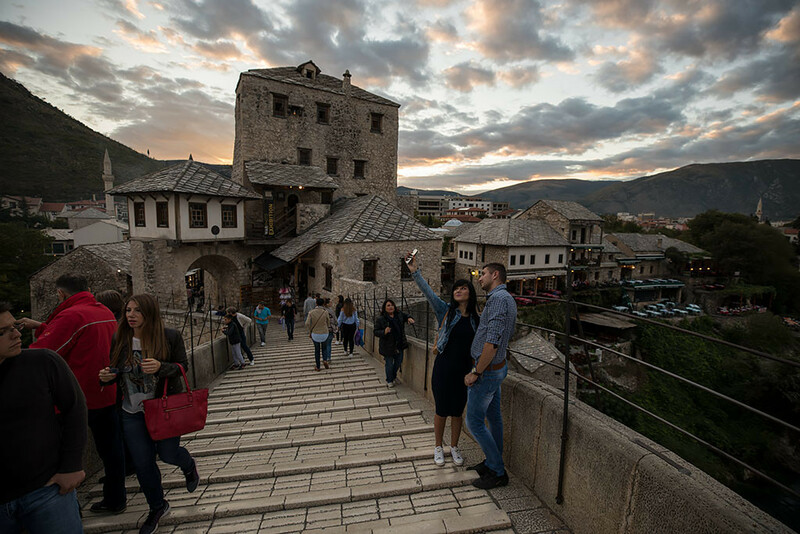 A couple taking a selfie on Stari Most. After the substantial breakfast and late lunch I just had an ice cream for dinner. And enjoyed the view of Stari Most at dusk at the end of day 2. 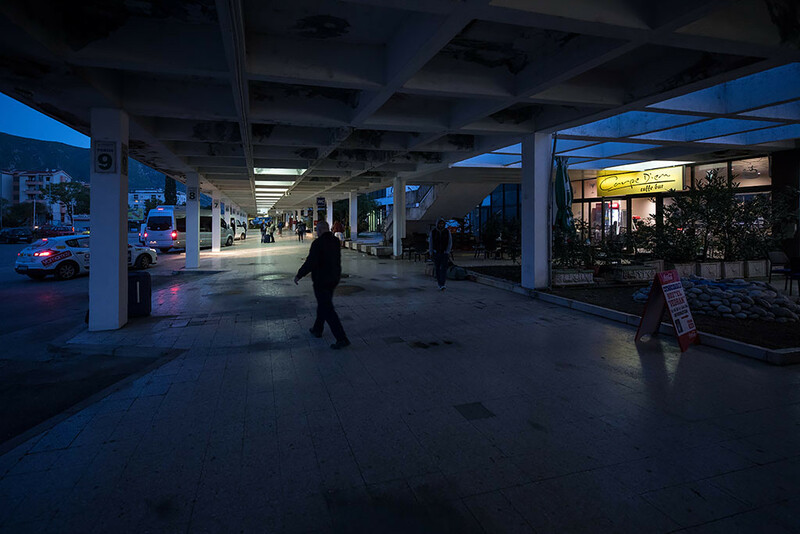 I got up early on the morning of day 3 and walked the 1.5 kilometres back to the bus station. 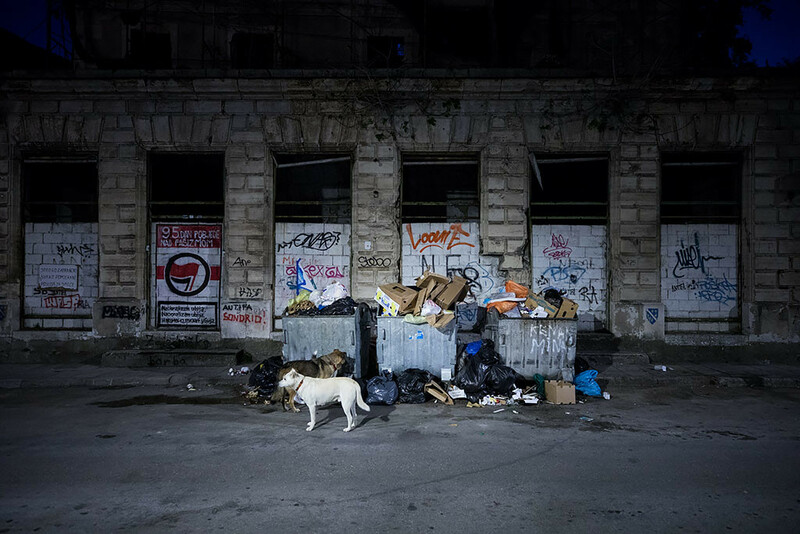 Passing by some dogs helping themselves to breakfast at a dumpster. And arriving just before 6:30am for the 7am departure. This time I didn't have to pay a bus station fee but did have to pay €1 for my bag. 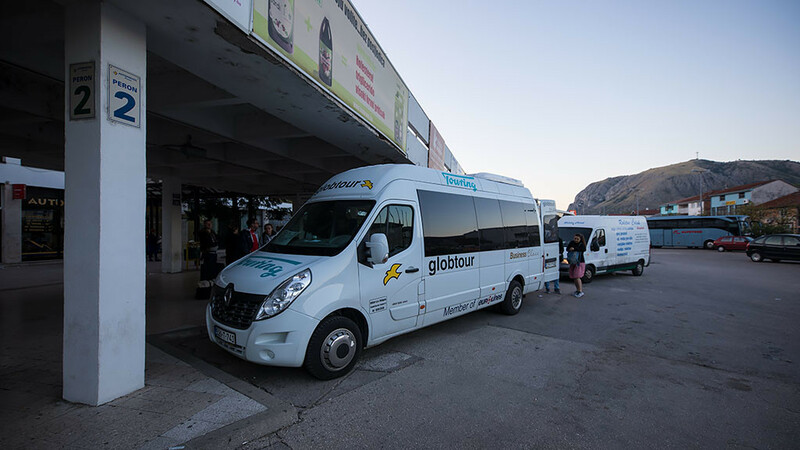 Just a minibus today for the journey to Montenegro. 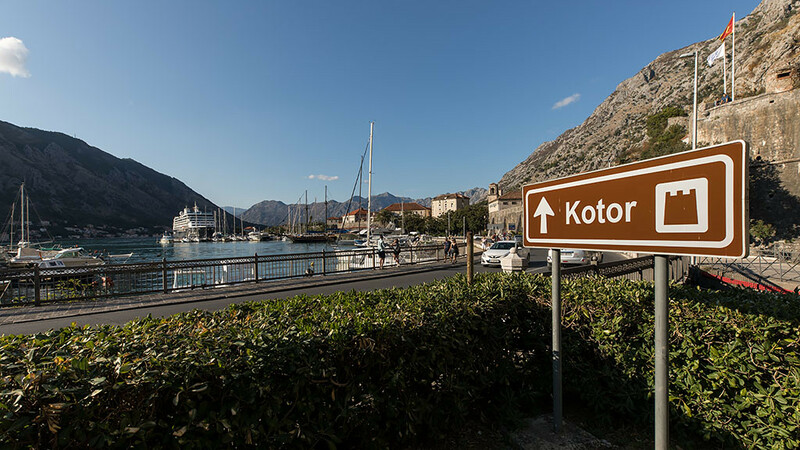 The route to Kotor. My ticket originally said a routing via Dubrovnik, but apparently it had been changed to bypass Croatia altogether today. It meant one less border crossing but an extra 3 hours of driving though. At our first stop to stretch the legs after a couple of hours on the road. 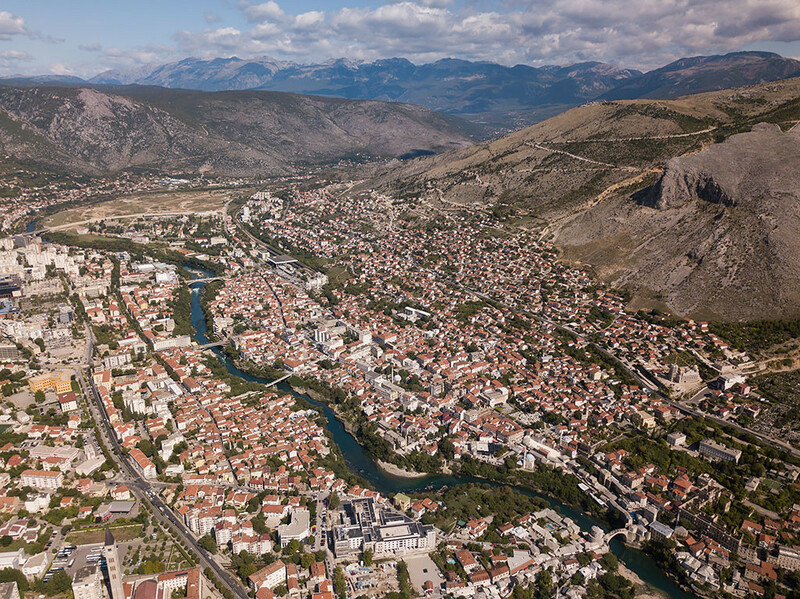 Looking down on the town of Trebinje just after 11am and where we had a 30 minute break. 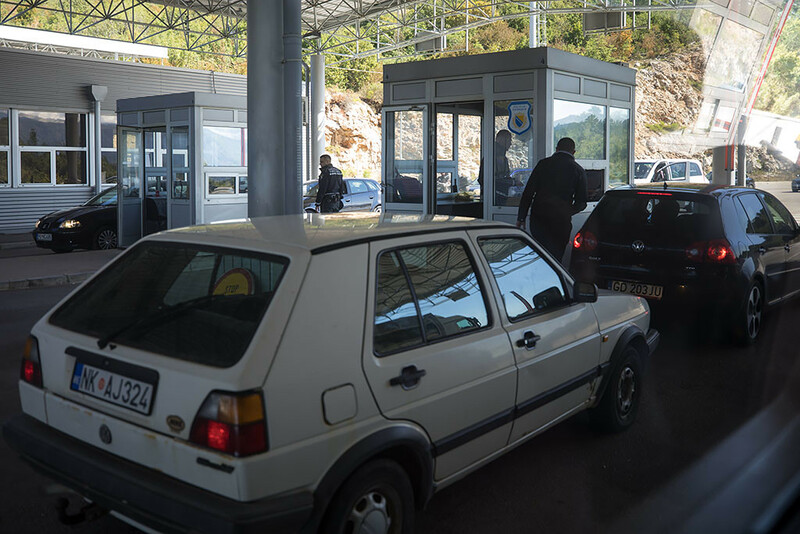 Crossing over at Ilino Brdo border and into Montenegro. 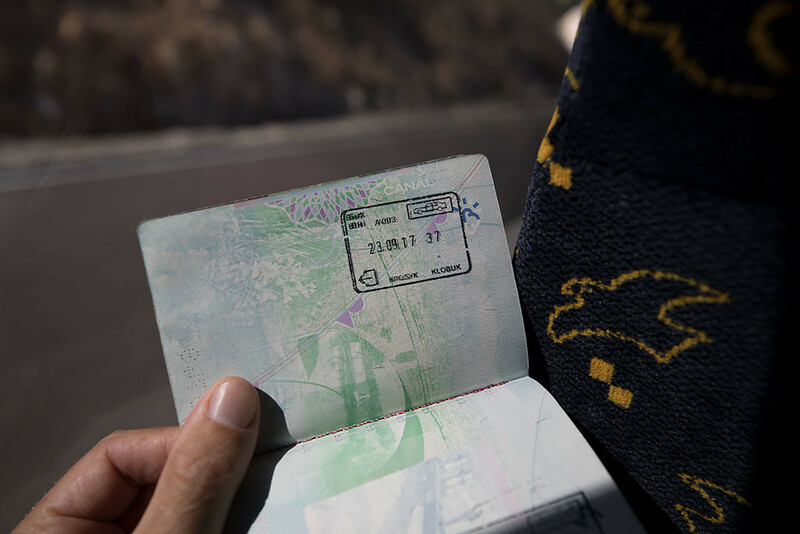 The driver collected everyone's passport to be stamped out of Bosnia and Herzegovina and the again on the Montenegrin side. 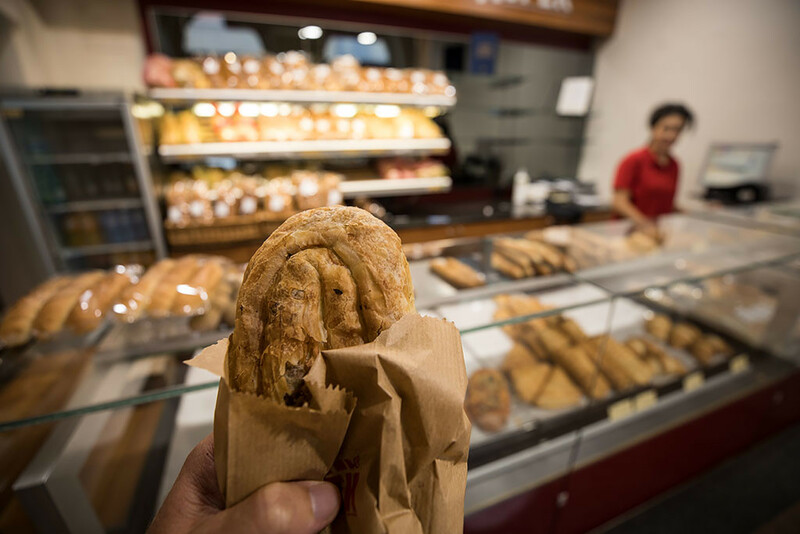 There was luckily no queue on either side and we were on our way relatively quickly. Another stop just after 2pm in the Montenegrin city of Nikšić. 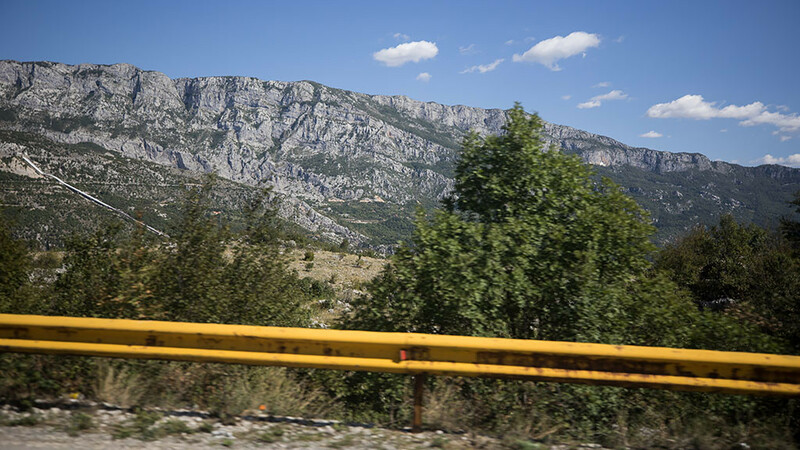 The view of the rocky ridge of Ostroška Greda as we make our way south. 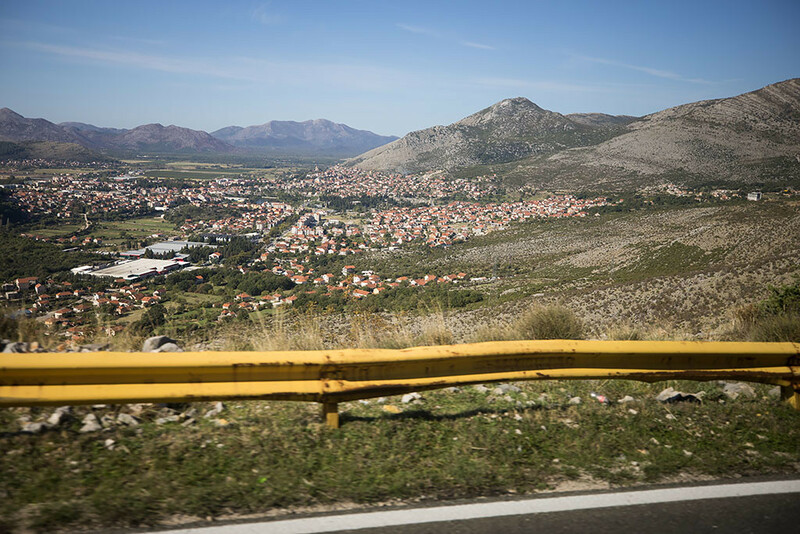 Stopping again in the Podgorica, the Capital city of Montenegro. Looking across to Bečići as the Adriatic finally comes into view. 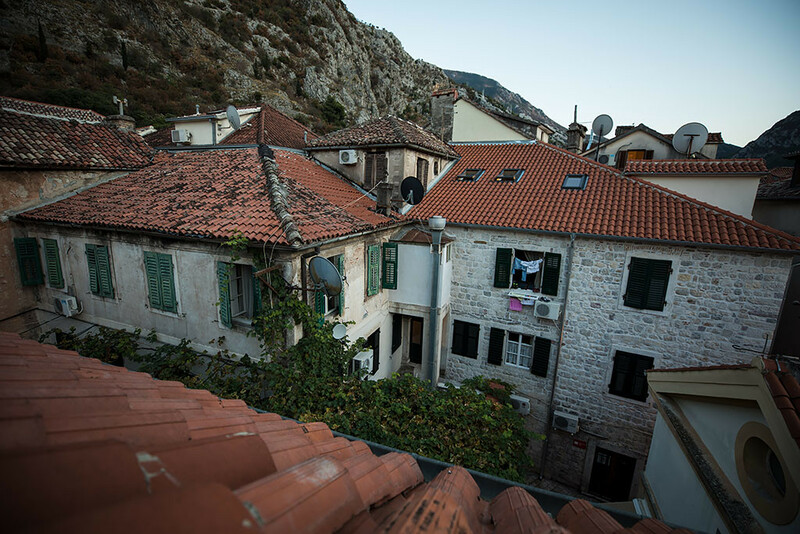 And just before 5pm and almost nine hours after leaving Mostar, we finally arrived in Kotor. 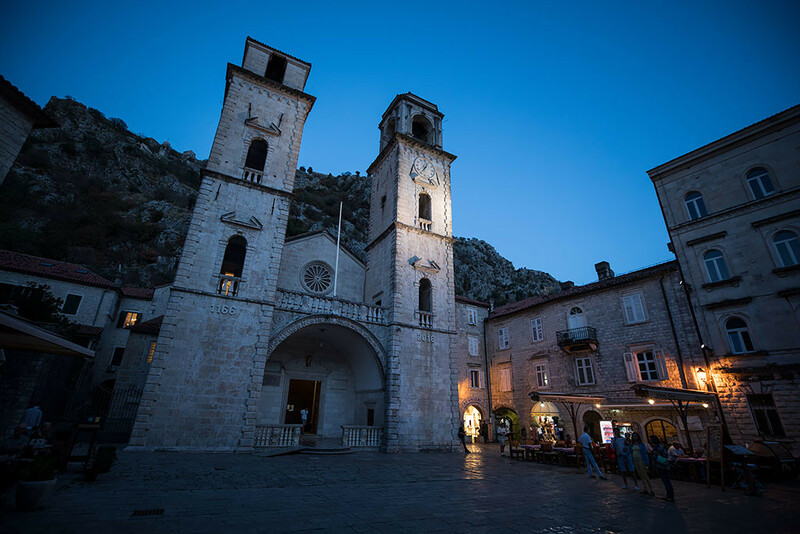 The daylight was quickly fading and I wanted to still do a bit of sightseeing, so after paying the €3 fee, I walked up through the Old Town and up the historic fortifications of Kotor. 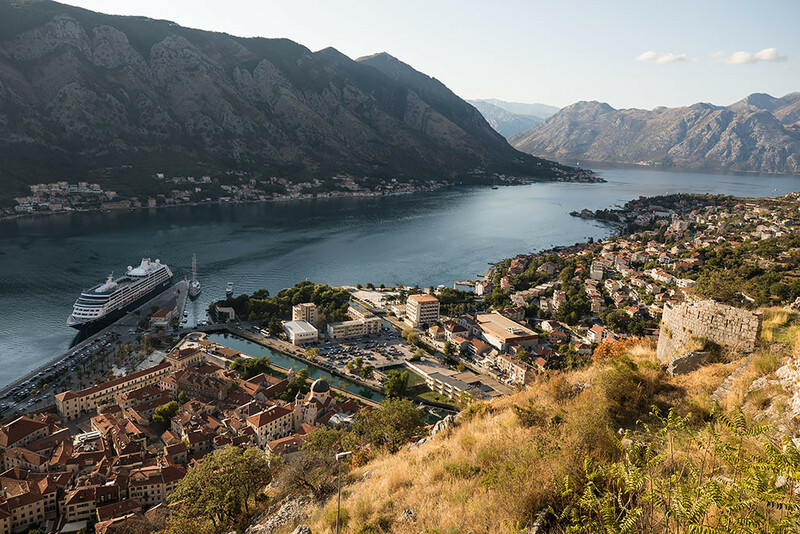 The Old Town of Kotor and Kotor bay in the late afternoon. Looking up at the rocky and barren terrain of Pestingrad Peak. 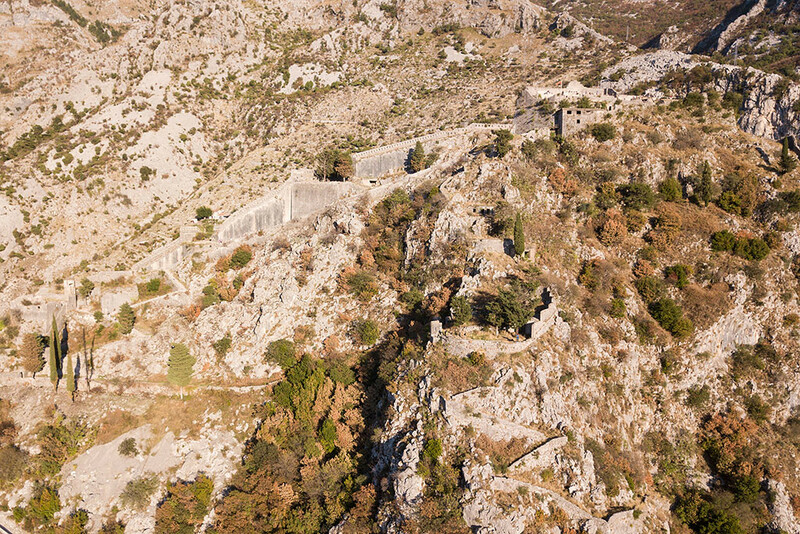 The fortifications of Kotor consist of historic ramparts, towers, citadels, gates, bastions, forts, cisterns, a castle and other structures that were designed to protect the medieval town of Kotor. The Azamara Quest in port. 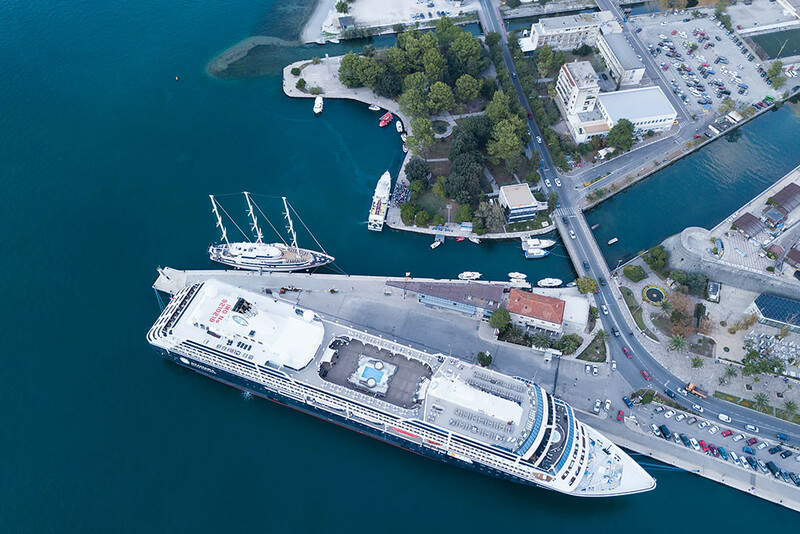 Many of the tourists that visit Kotor arrive by cruise ship. I then walked back down the hill into the Old Town. 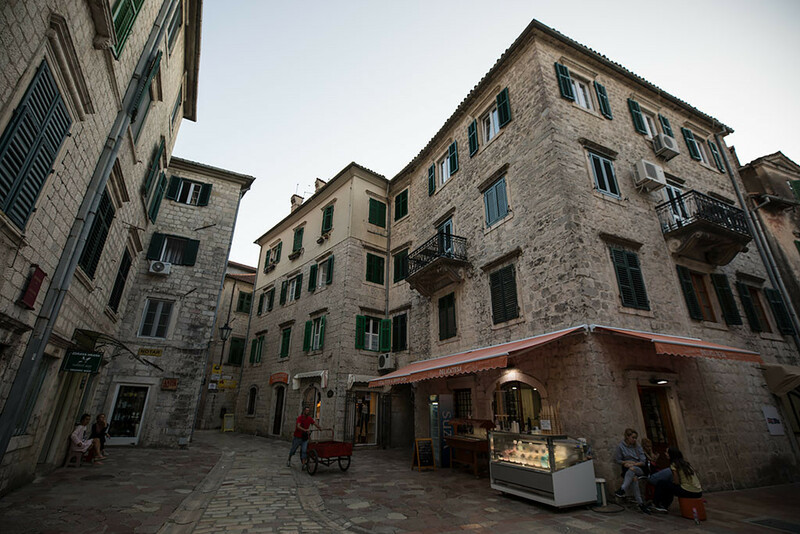 The warren like streets and alleys of the Old Town were quite easy to get lost in. My Airbnb for the night in the Old Town. 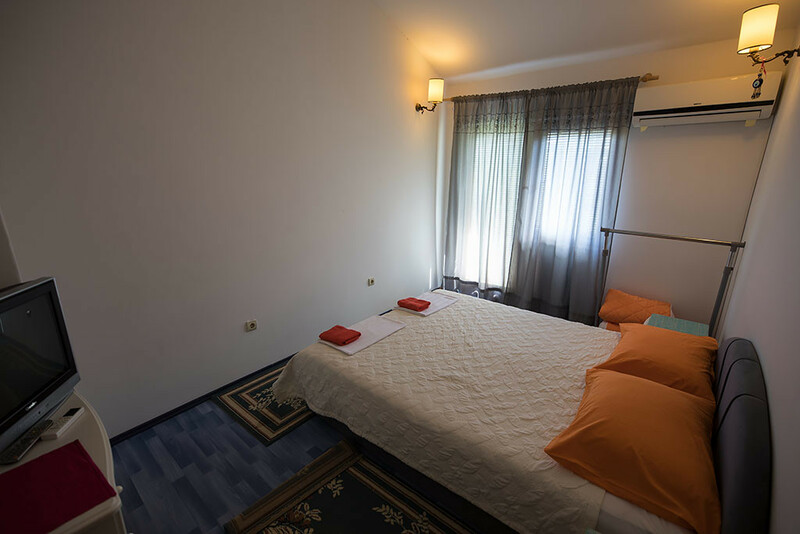 Quite spacious and only €50 for the night and very good value. The view from the third floor window. I then went for an evening stroll through the Old Town. The Roman Catholic Cathedral of Saint Tryphon. 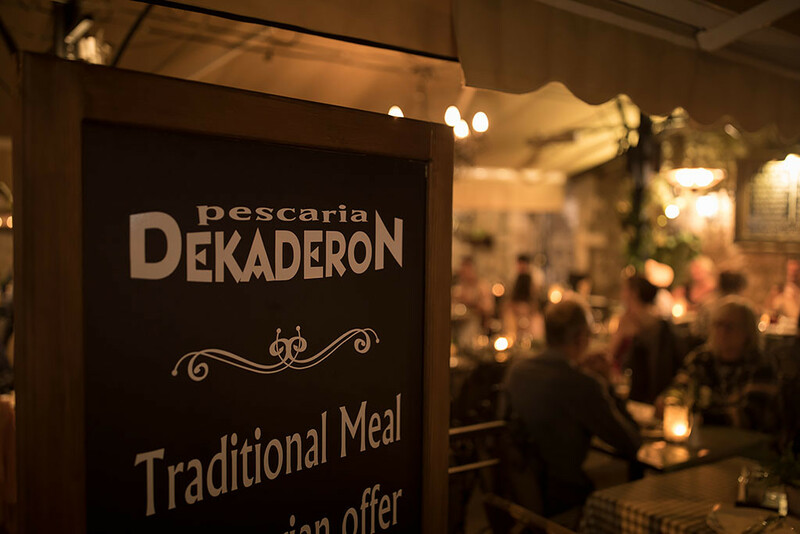 For dinner I headed to the nearby Pescaria Dekaderon on Tryphon Square. 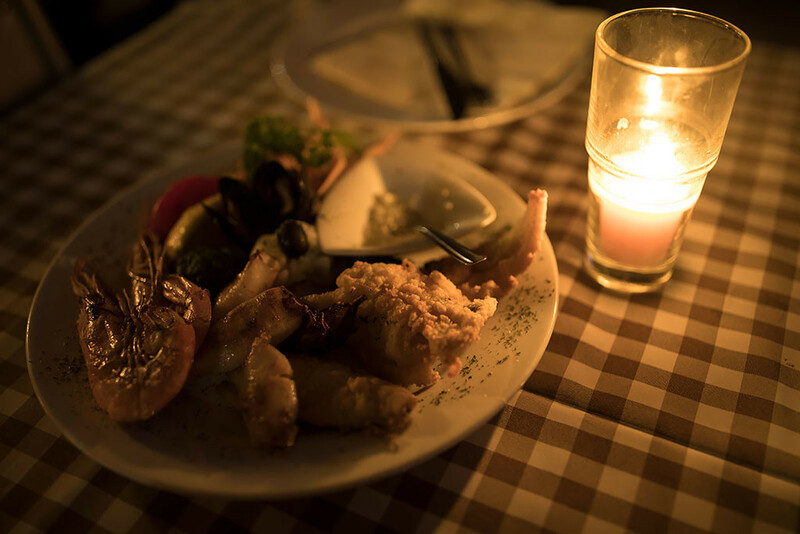 And enjoyed the very tasty seafood platter. Afterwards I went for a walk along the bay. 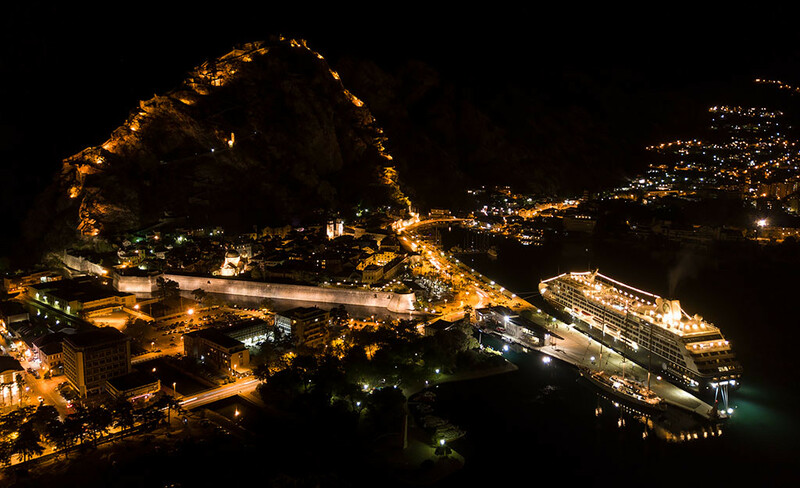 Looking back on Kotor with the fortifications on the surrounding hill all lit up. 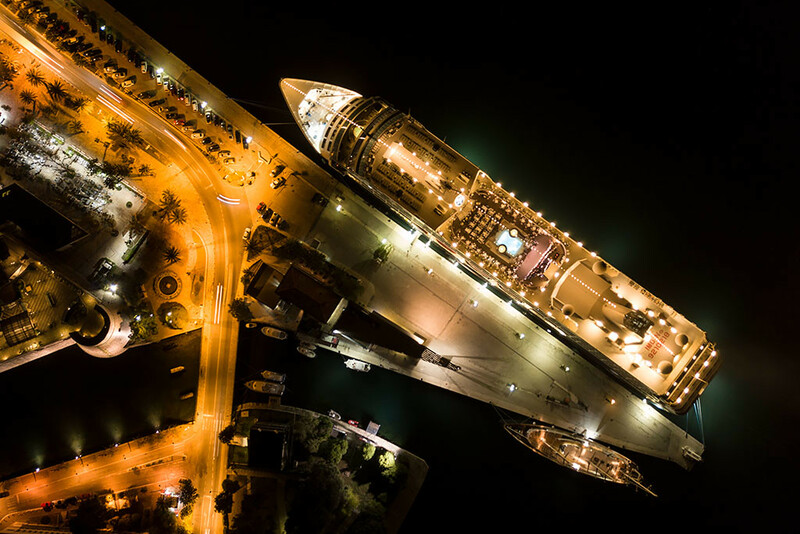 And looking down on the cruise ship Azamara Quest at the end of day 3.